Despite having a week off work, and despite that week being largely sunny and dry, and even though the injections in my knuckles are finally starting to take effect, events have conspired to keep me distracted from my boat building. 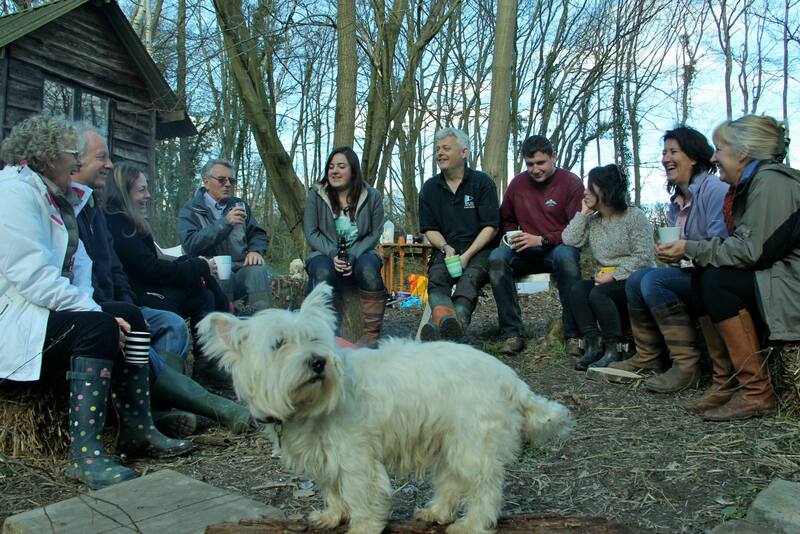 An Easter weekend invasion, a welcome one, but an invasion nonetheless, kept us busy with campfires and singalongs. The Brian Flynn medley has been sung, now Toby takes a turn to entertain us. Things got a little damp at this point. So it was an action packed sunny break and back at work I’m wondering when I am going to be able to squeeze in some boat work. The mast step is very slowly progressing and I’ve been scavenging plywood offcuts to make templates for replacement frames. 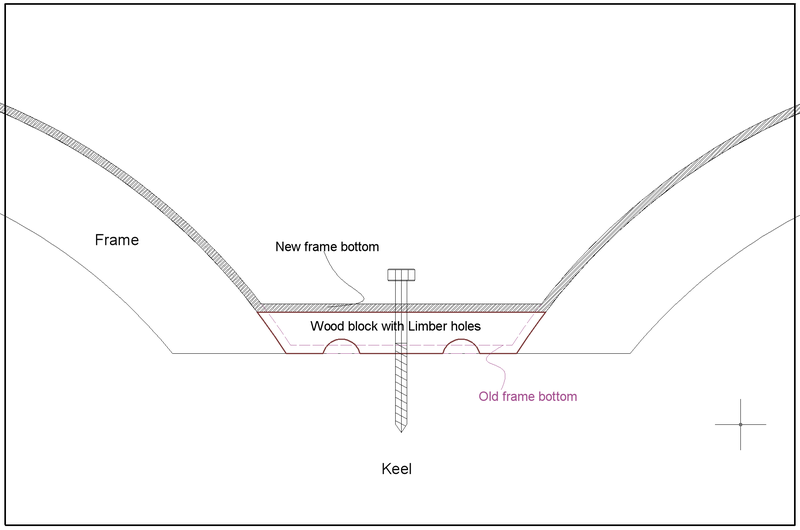 General consensus seems to be, that sistering frames (bolting a new frame or section of frame next to an existing one) is a bit of a bodge, resulting in weak spots and extra weight. It looks likes there are around half a dozen frames that could really do with replacing so the next job will be to make templates with a hot glue gun and skinny ply then make a former and laminate some up in oak. Squeezing them in in one piece may be impossible so I might need to look at making them in two bits. 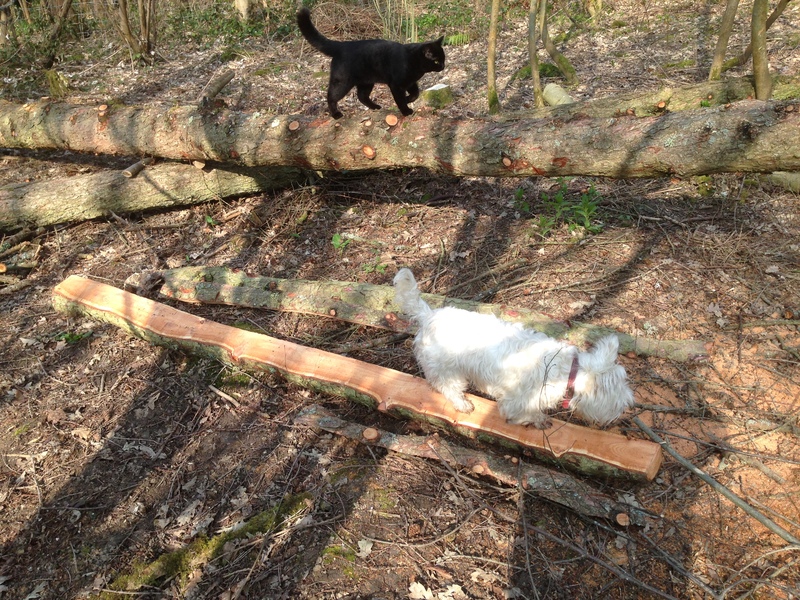 I also tried my hand at converting some of the felled larch into beams….. and despite my little hairy helpers. Chester and Rafferty helping out. The result was less than satisfactory. 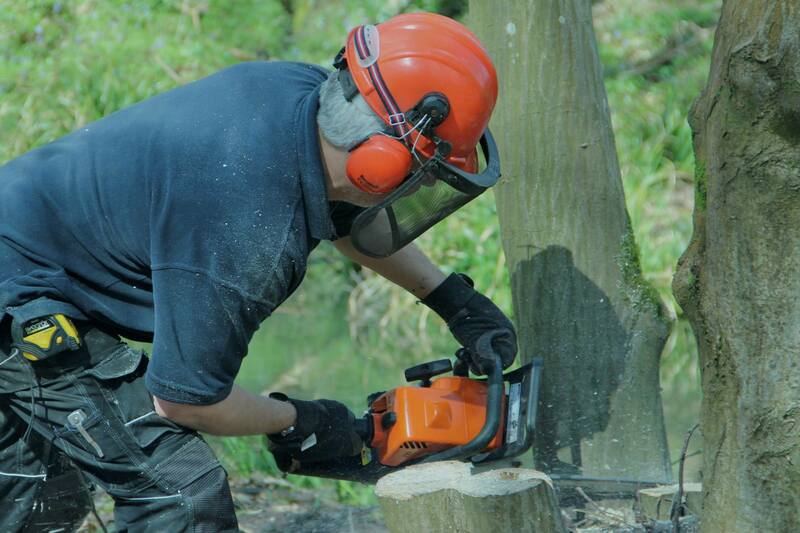 I’ve invested in a chainsaw planking guide from http://www.fisher-direct.co.uk/ (arborist supplies and equipment). It is reasonably priced and I’ll let you know how I get on. 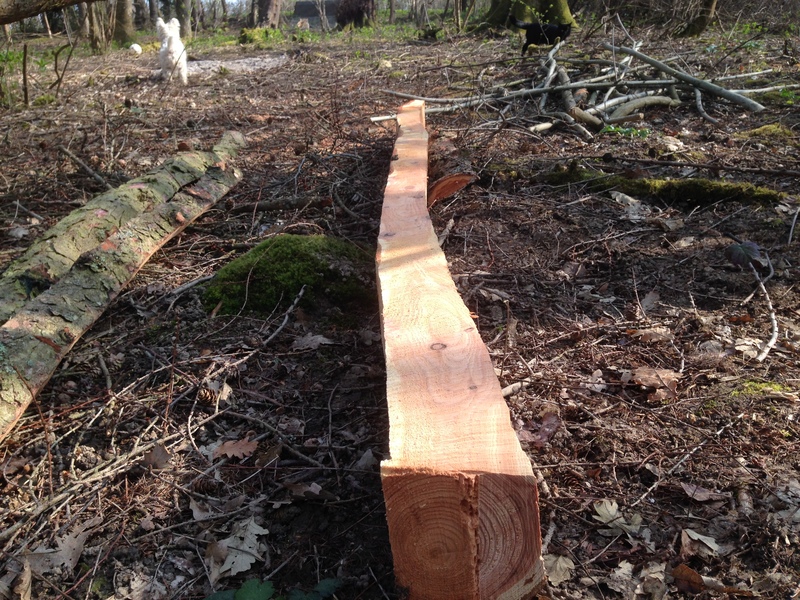 An article in Classic Boat about a builder who bought a plot of woodland and felled enough larch and oak to build a 26 foot yacht has inspired me to think about planking and seasoning the larch rather than make it into beams for the deck of the cabin in the woods. 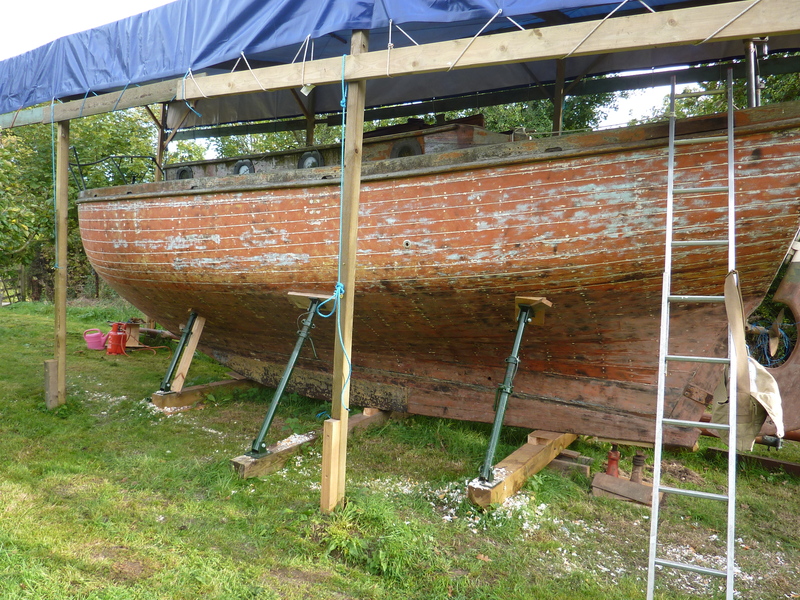 After all Flamingo will need a tender, 🙂 and larch might be a good substitute for Pitch Pine when it comes to her own planking repairs. I love a good bonfire! I love a good bonfire! Clearing up the winter pruning and other debris that seems to self generate here is so satisfying. 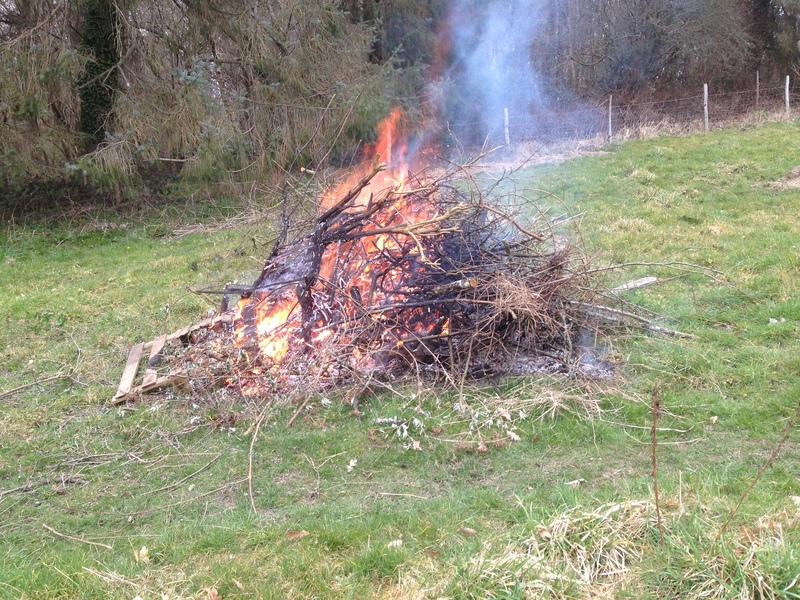 The crackle of the fire as it starts, then the roar as the wind rips it up through the pile of dead brambles and leaves, warms body and soul. Apple smoke takes me straight back to my grandparent’s garden in Oxted where there always seemed to be a fire smouldering at the bottom of the garden. That, and the smell of old creosote on weather boards and I’m back in the 70s, spinning around in the ancient summer house that rested on rails so as to perfectly angle it to the sun. Or rummaging around to find the croquet set for a game on Grandpas manicured lawn. Of course once the plane was razor sharp… yes razor! 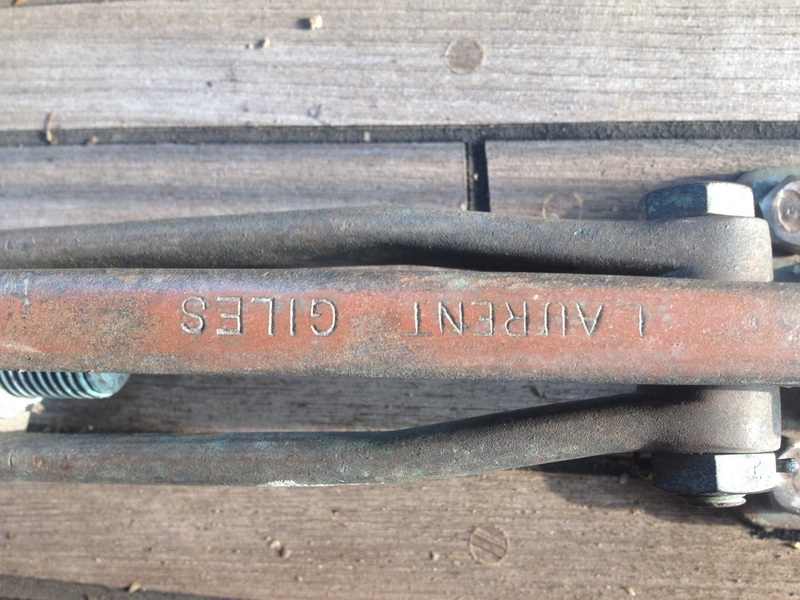 Note the jewellers loupe for examining the edge…. look its either sharp or it isn’t. I’m not a pedant, I just like it to be perfect… anyway, once it was sharp I decided that what I really needed was a workbench rather than the floor to work on, so, in the style of one of those irritating DIY programmes where they build a floating pub out of scrap wood for no money whatsoever because they had two canoes, 16m square of brand new decking, a bunch of 8×2 all the fixings, and an old gazebo just ‘lying around’, I simply fitted this old bench with some fence post legs and hey presto! 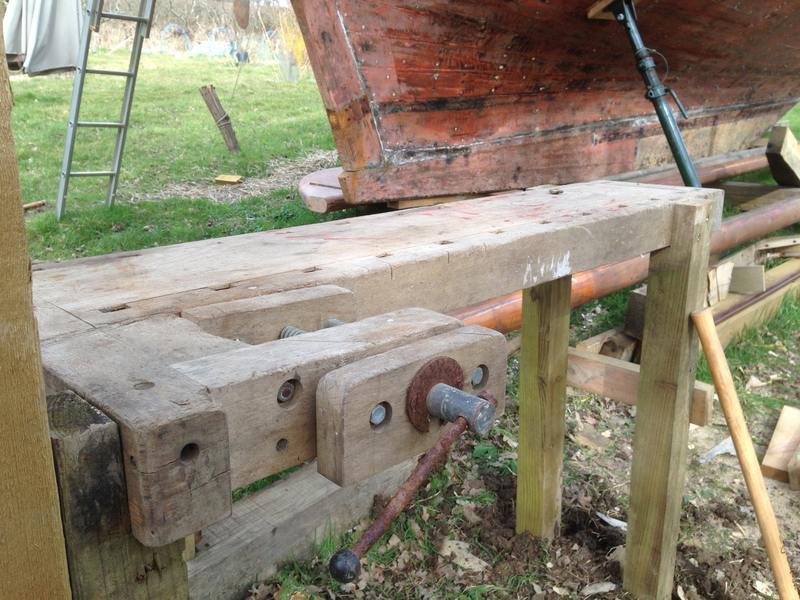 A lovely solid workbench right next to the boat! Working on the ground has its limitations so I’ve put this old bench up. 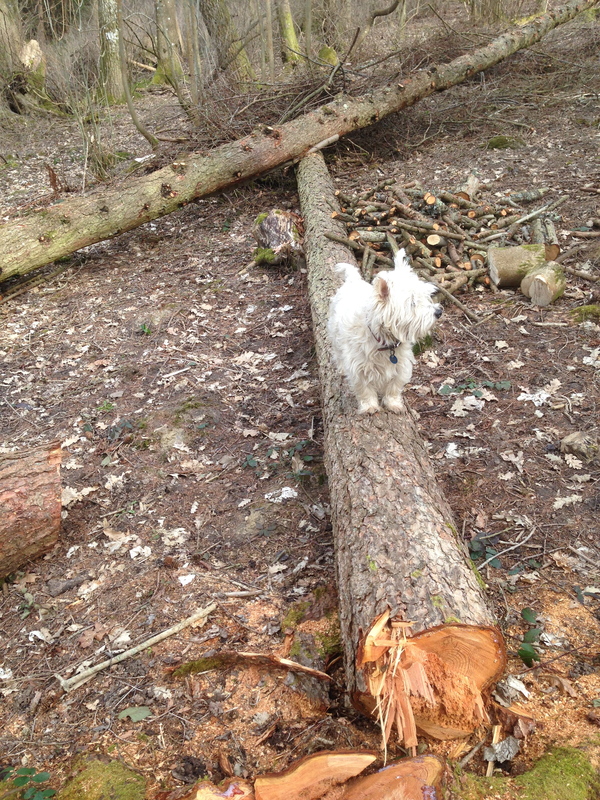 Meanwhile, in another part of Hundred Acre Wood (ok 3 acres) Chester poses for scaling purposes on some recently felled Larch that we are planning to use as a deck for the Cabin in the Woods… although… I wonder if larch might be a good substitute for Pitch Pine…. mmm. 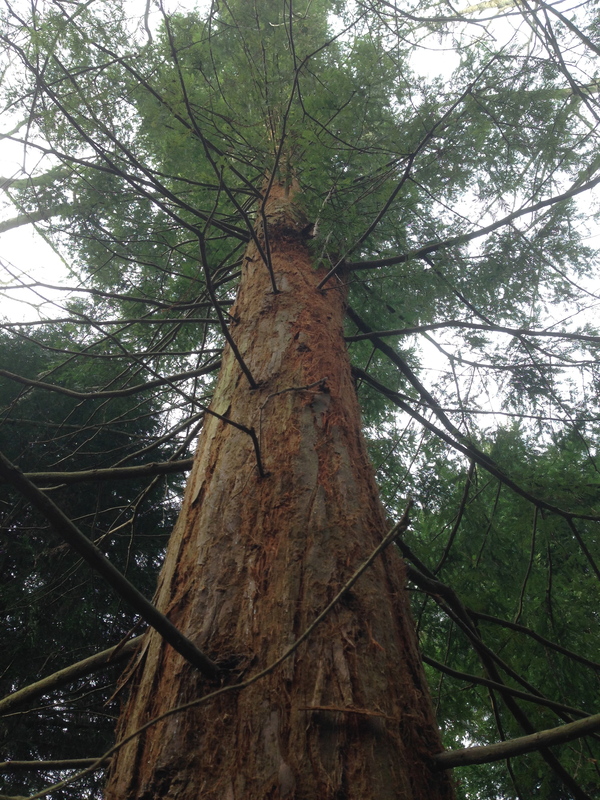 Mother has added to her ‘estate’ and bought a bit more woodland so she and I ‘Beat the Bounds’ and discovered two Redwoods growing in the new plot. Discovered two Coast Redwoods in mother’s new plot! So the weekend came and went, Mother’s Day saw us pottering around the Walled Nursery, a beautiful walled garden near Hawkhurst. Then on to the Brown Trout for what turned out to be a surprisingly good carvery. Delicious beef! 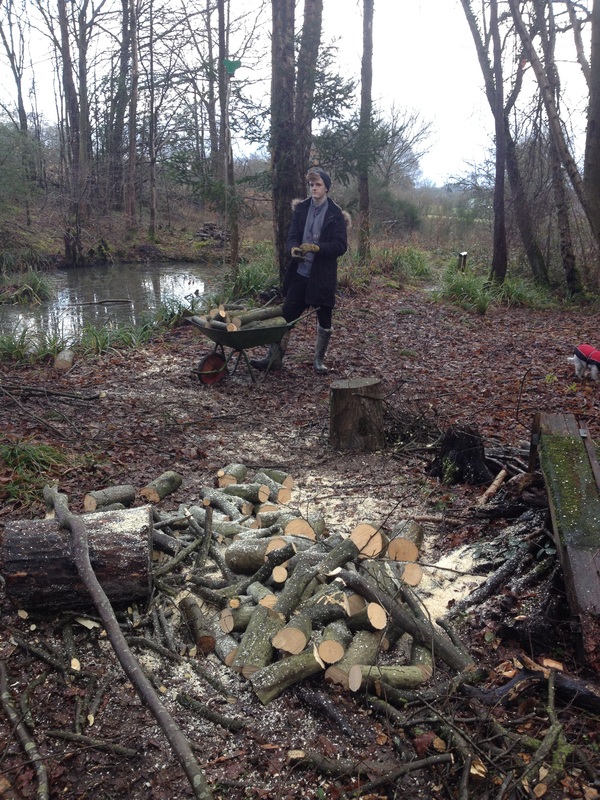 More work in the woods this weekend, weather permitting. 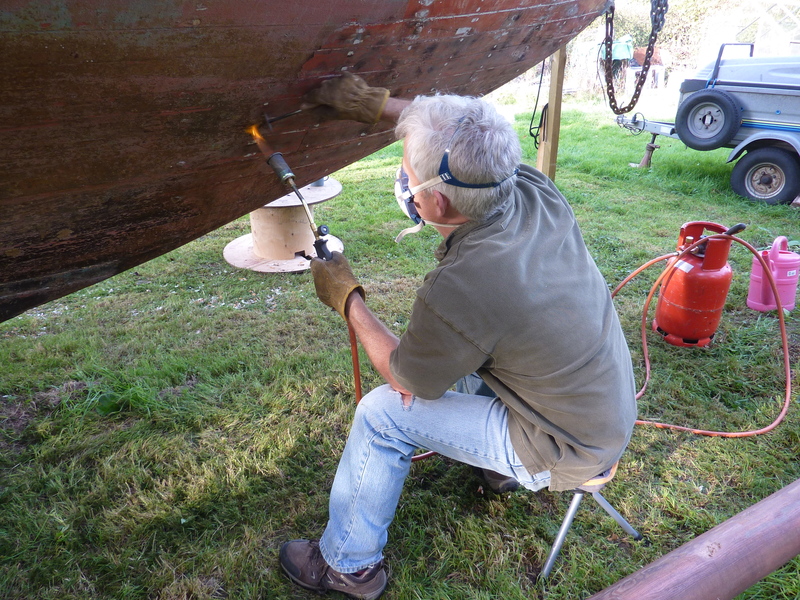 You may have noticed a dearth of activity from the orchard boatyard…. My enthusiasm isn’t waning but even though the days are lengthening there just never seems enough time. 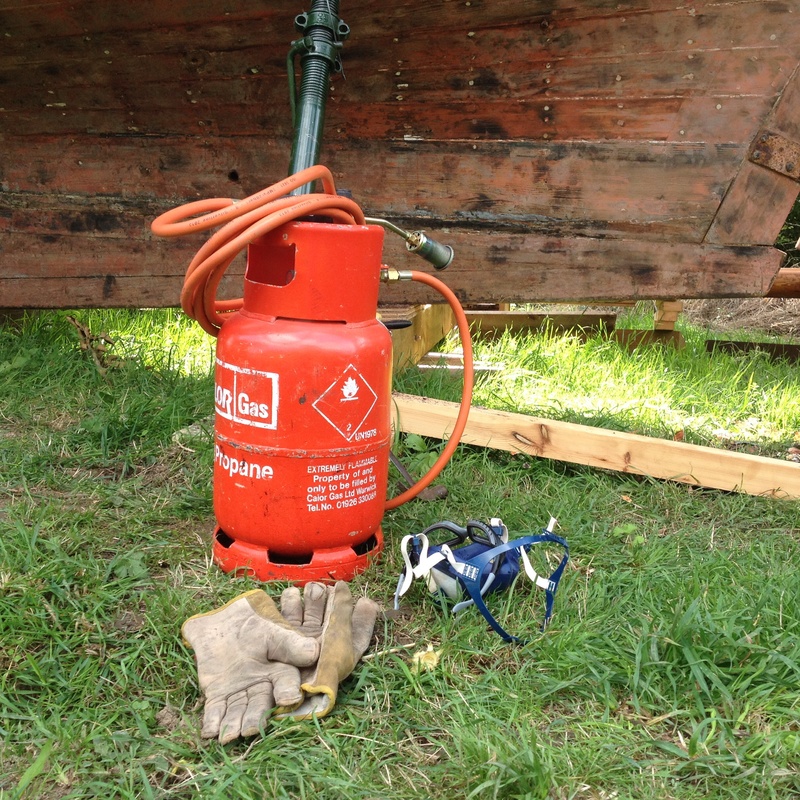 Last weekend was no different and despite the glorious sunshine all I managed to do was pop up to the field and note the tarpaulin is just about surviving, poke my head down the companionway to check we weren’t filling with water and that was it! One bit of news though, I’ve been published! 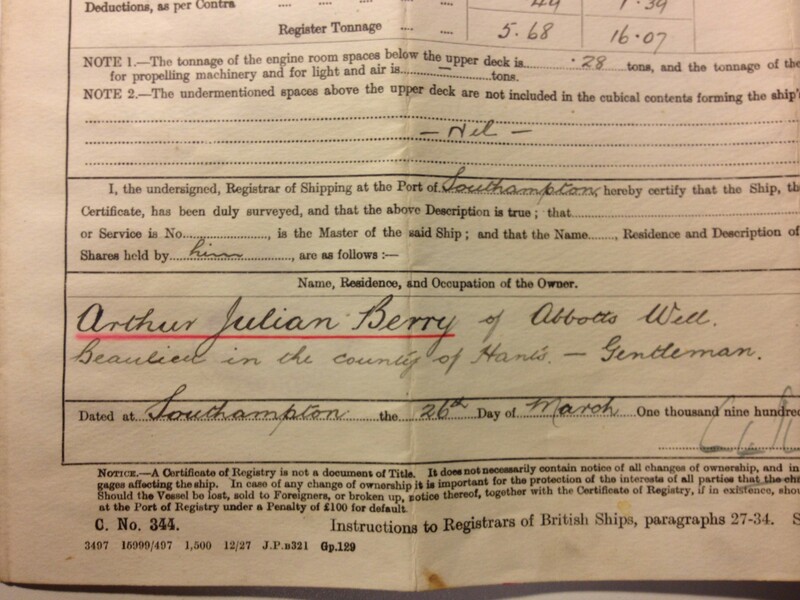 OK so its only the letters page of Classic Boat and they called me Jonathan Weir for some bizarre reason, but still…. Flamingo is in print. 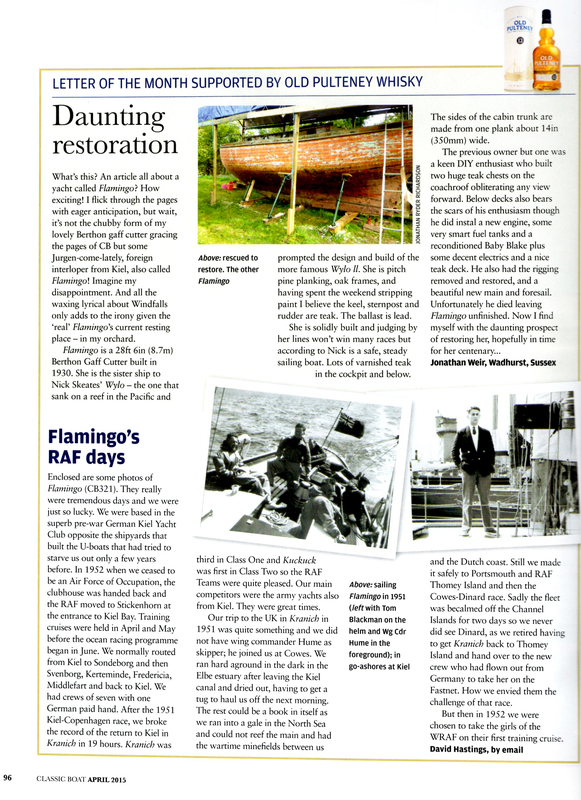 Last month’s magazine included an article about a Windfall Yacht from Kiel also called Flamingo which prompted me to write this letter. Looking forward to lubricating the work with a drop of Old Pulteney! 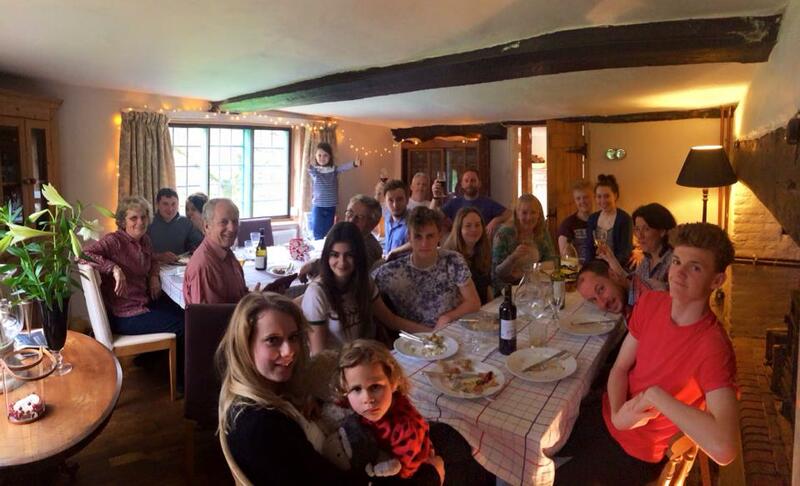 In the same way that working on Flamingo isn’t really work, though it takes a lot of effort, having 13 for lunch takes a lot out of you, but the joy of having your family around you puts it all back. 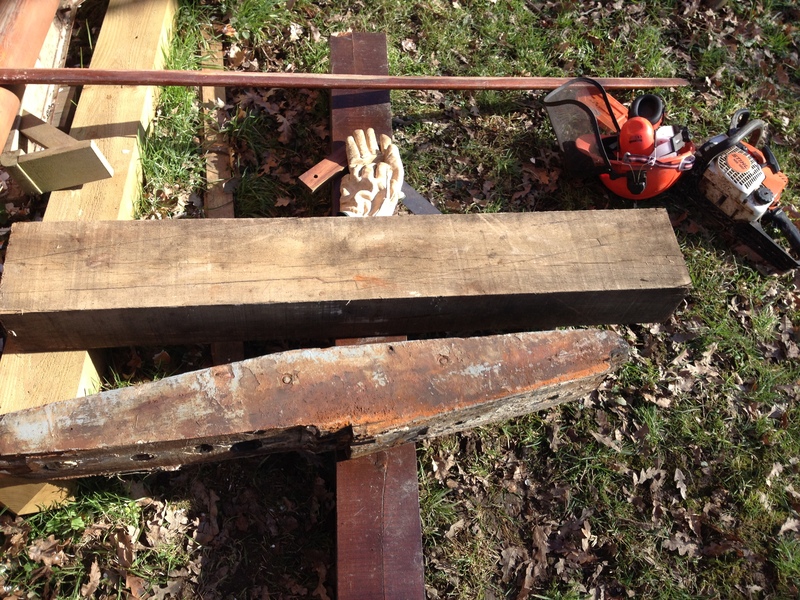 What a joy to be working with wood outside in the warm sunshine. OK so it was actually only 3 degrees with a wind chill that made it feel like minus three and the damp ground was leeching warmth through my knees as I worked, but the inch and a half razor sharp chisel that Mike gave me, sliced smoothly through the oak like a hot axe through butter, and the smell of the tannins wafted up to my cold, sniffing nostrils. After tracing around the original mast step, I had roughed the shape out of a hunk of Oak with a chainsaw, less poetic perhaps, but it certainly got the job done quickly, then taking if not my life, then certainly the fate of my shins in my hands, I set to with an adze to clean up my frankly a very dodgy saw line. 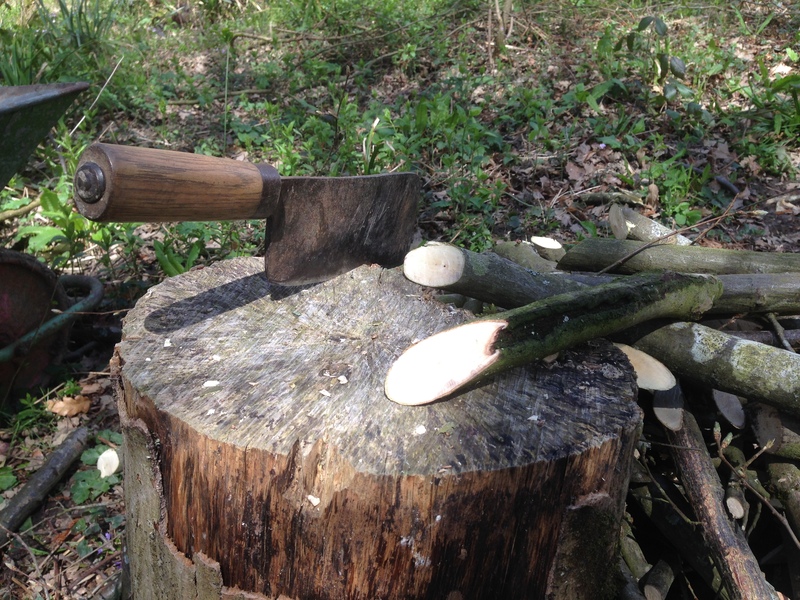 I’m really not a traditional methods purist, but whilst appreciating the convenience and speed of modern tools (hence the chainsaw) there is certainly something about a sharp blade and a piece of wood connecting that is so satisfying it is worth the extra time and effort, worth learning how to angle the blade just right to get a neat scallop of wood. 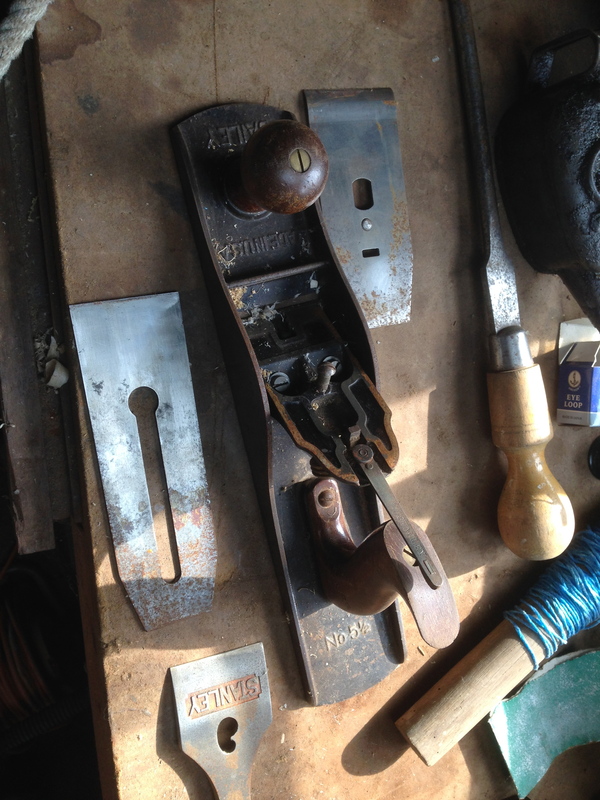 Perhaps too, there is a deeper connection, a connection to the generations of boat builders who have hand built boats outside in all weathers with few tools and just the skill of their hands, a keen eye and a keen blade. 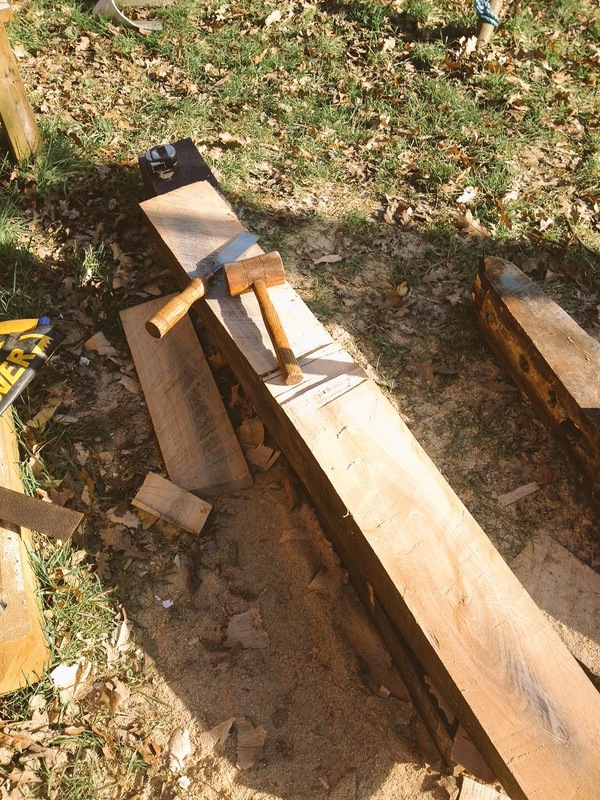 Of course if you’d handed me an electric planer or better still a bandsaw beefy enough to do the job I’d have dropped the adze (carefully) like a shot, but then I wouldn’t have had that sunny, memory tucked away in my head to pull out on a tedious screen staring work day. I wouldn’t have the thunk thunk thunk of the adze and the ring of the blade in my ear to counteract the click click click of my Mac keyboard. At my desk I never see the flutter of a hopeful Robin, ever watchful for the outdoor worker in case there are worms in the offing and there is certainly not the high piping call of a buzzard drifting on the wind. It’s what weekend are made for. Though the wind chill was just that, chilling, the sun was warm, so warm in fact that the boat was sweating! On closer inspection and a quick sniff the cause was revealed. There has obviously been a leaky diesel tank at some point and the wood must be soaked in the stuff. 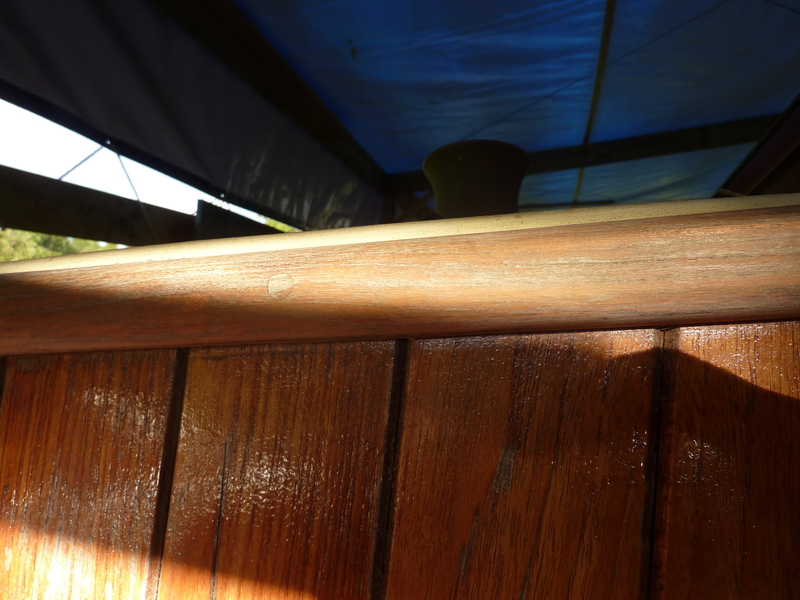 The heat and the low angle of the sun was heating up the planks, bringing it to the surface. Hopefully it will all evaporate before it is time to paint! I love internet shopping! Lunch time on Thursday I remembered I really did need that extra large adjustable spanner if I was going to undo the huge nuts holding the mast step in place, so I ordered it…. Saturday morning it arrived! 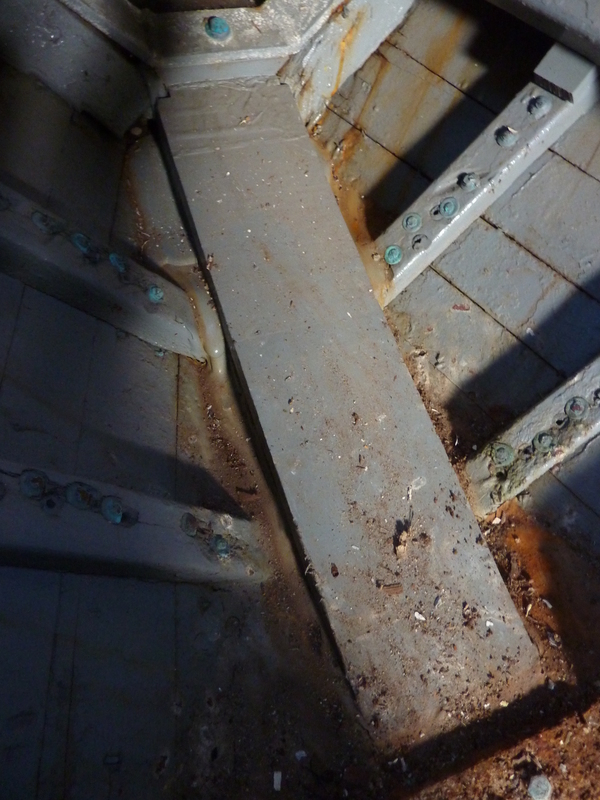 By Saturday lunch the reluctant mast step was removed along with a very badly corroded steel floor. £17 well spent! The massive lump of oak reminded me of a piece of timber we once dug out of the foundations of the house, a relic of the old mill that used to stand here. It had lain under the ground so long it had turned to a dark ebony like material that was so brittle and crystalline it fractured across the grain and blunted tools very quickly. 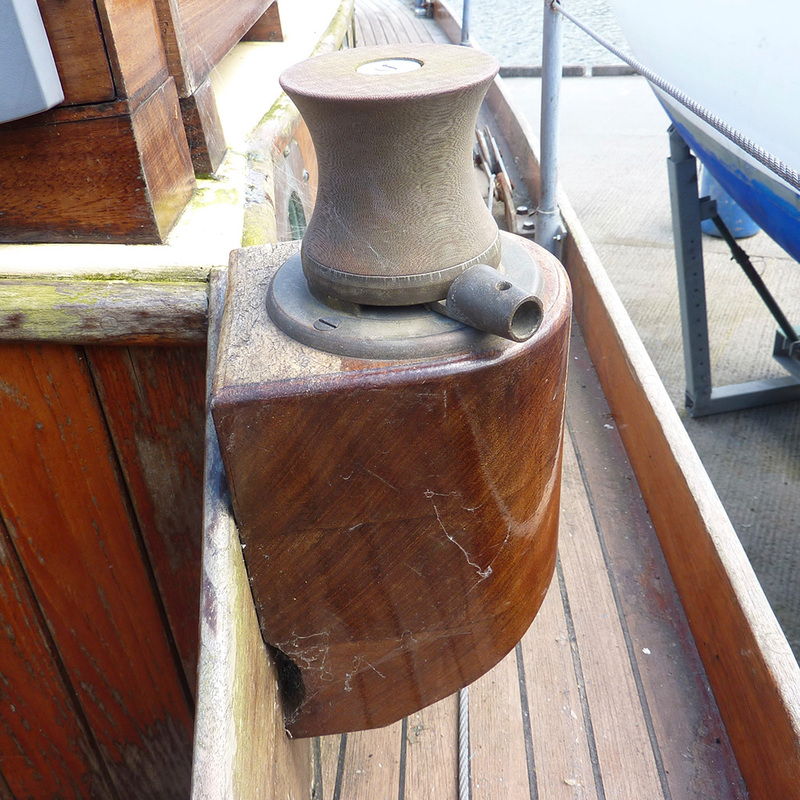 The mast step showing signs of nail sickness or turned to bog oak ? Removal came with a lot of sweat and swearing and at one point I considered just leaving it. Once removed though I was glad I persevered, given the rot that was revealed in the frame and the level of corrosion of the steel. 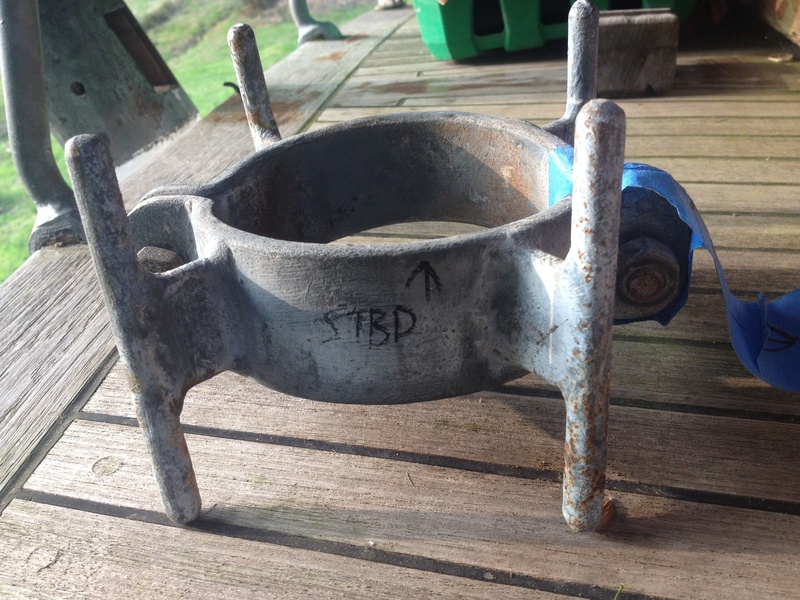 The base of the mast is such a high stress area I’ll be much happier with a new step, and repaired frames. 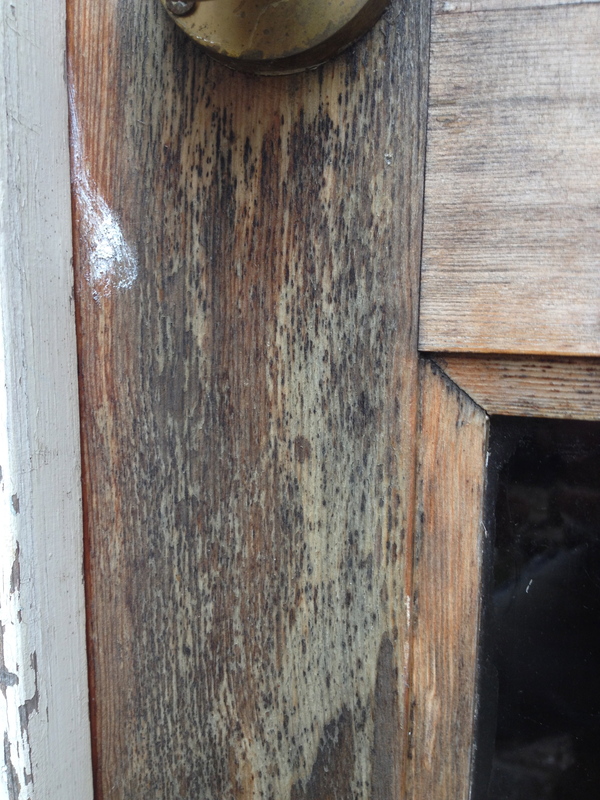 This frame has a large spongy area of rot where the floor bolts through. The picture doesn’t really do justice to the extent of the rot, but when one of the bronze bolts just fell out and my probing screwdriver sank an inch into the soft pulp, I realised something was amiss. I am wondering whether to keep the Baby Blake at all or whether a modern cassette type toilet might be better, less holes through the hull, less mechanics to go wrong. 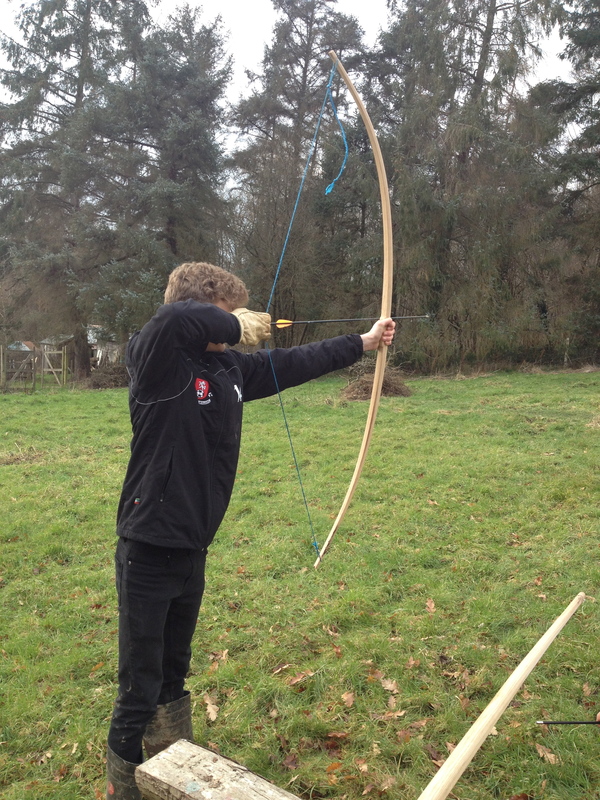 The weekend wasn’t all about Flamingo (Tracy may beg to differ) There was apple pruning, whittling, and archery too! And finally. The Old Man has hung up his ditty bag…. or at least passed it down to me. 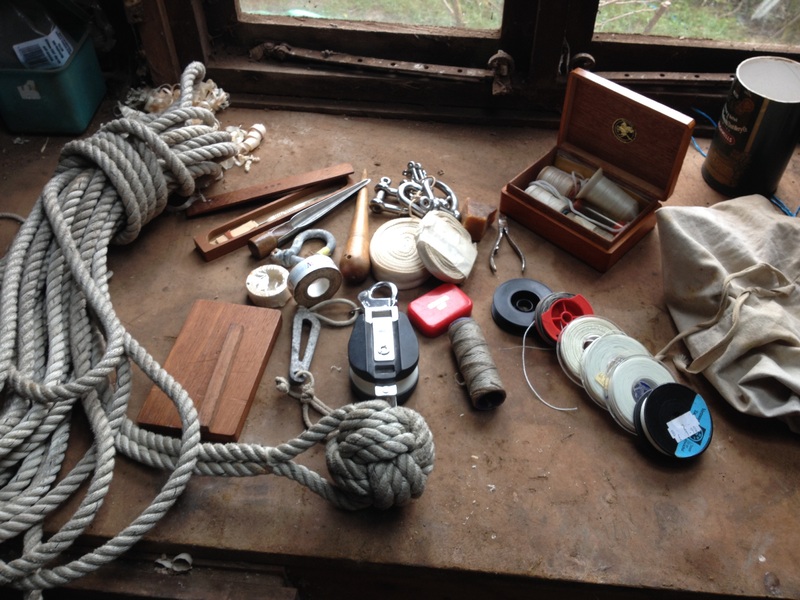 Its a treasure trove of well used, much loved sailing paraphernalia, whipping thread, fids, shackles and needles and more, all in a canvas bag he has had since sailing Dulcimer, a 1973 Bowman 46. 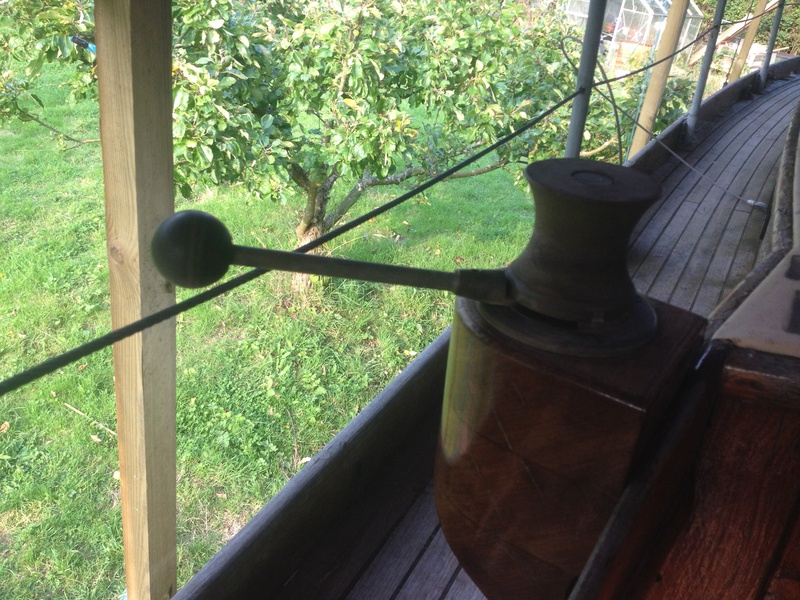 The heaving line with Monkey’s Fist is the same vintage and similarly well used over the years. This weekend’s entertainment saw me limbo dancing at bizarre angles in the depths of the hull trying to get to the bolts holding the steel frames. At one point balanced precariously on my midriff, head down in the belly of the engine bay I felt myself toppling forward and briefly wondered, if my outstretched legs had not countered the motion and, pendulum like, swung me back, how long it would have taken my wife to find me wedged upside down in there and effect a rescue. 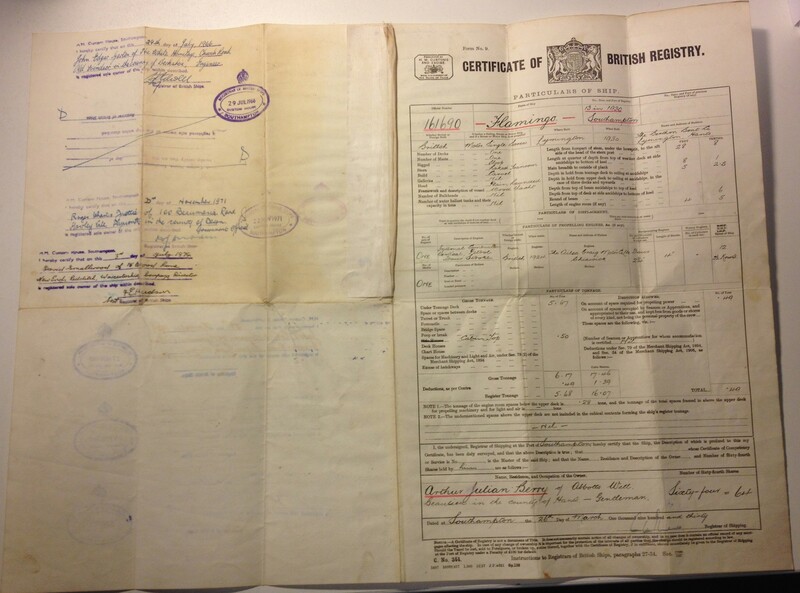 Later that evening over a glass of wine I was unsurprised to learn… quite a long time! a very narrow space to find yourself wedged in! Grinding the rust and accumulated build up of paint and dirt off the steel floors was very satisfying, if a little alarming when the amount of corrosion was revealed. 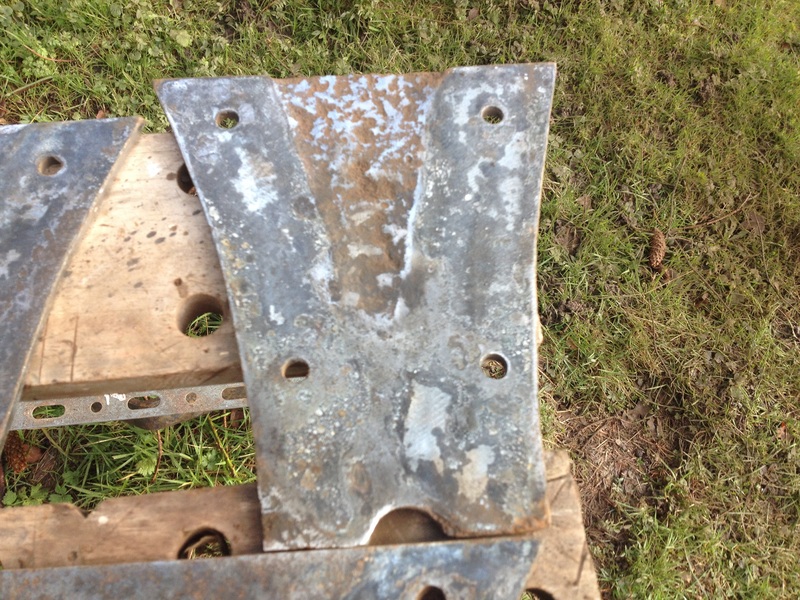 If they hadn’t been galvanised I dread to think how bad they would have been. Where this plate was in contact with the wood and sealed with putty the steel is relatively clean, but in the centre it is deeply pitted from contact with the damp mulch that had accumulated there. 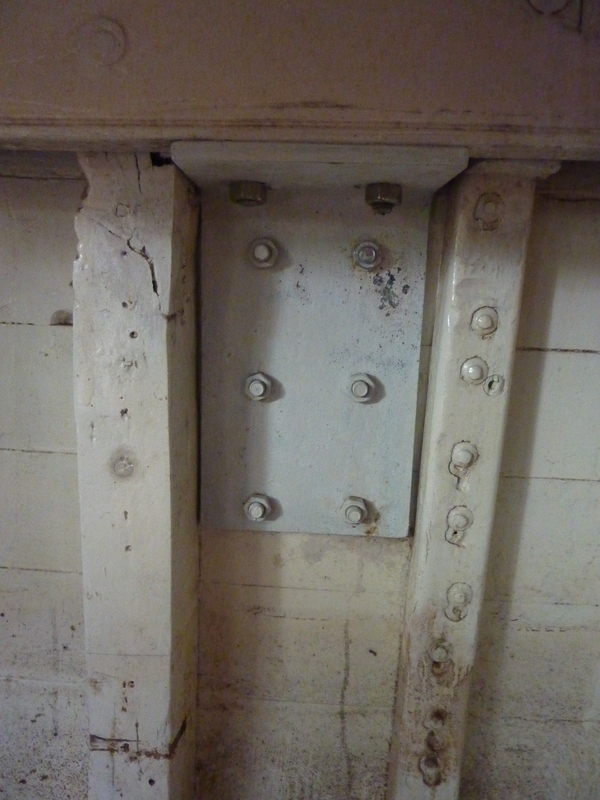 The three steel plates have limber holes (holes designed to let water drain to the lowest point of the bilge where the pump is) none of the strap steel floors have this so there will always be a tendency for water to pool behind each one – a recipe for corrosion. 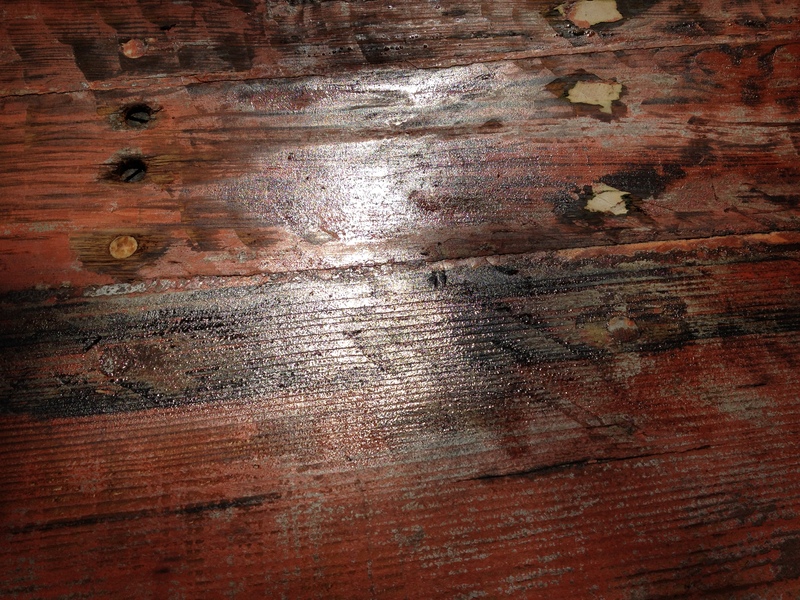 The flat bottoms of the floors are so corroded I’m tempted to get new ones welded on and bolt them back through wooden blocks that incorporate limber holes….. I feel a little sketch coming on… something like this maybe? Killing two birds with one stone. 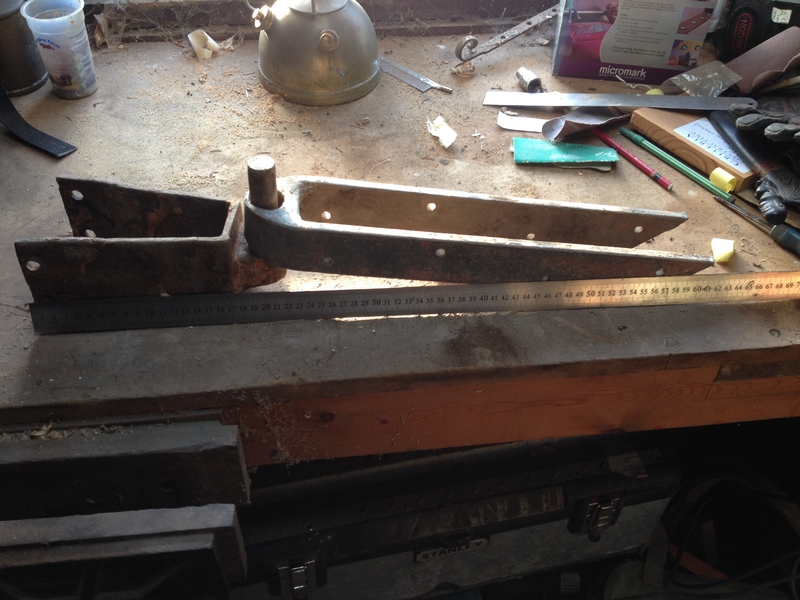 Adding limber holes and removing rusted frame bottoms. I am definitely still on the egg breaking stage of this nautical omlette, Flamingo is looking very sad and grubby inside. I might spend some time this weekend giving the inside a really thorough clean, it needs to be done and will help show up any other problems I’ve missed. Both benches gone and evidence of water ingress. I think she must have been left with water in her for some time, which would explain the poor state of the steel floors and the brown muck everywhere. Seriously thinking it may be sensible to remove the whole interior and start with a blank canvas…. The thin end of the wedge! I’ve taken the plunge and removed a bit of planking! It was damaged at one end and had to go. It turned out to be the thin end of a scarf joint (hopefully not the thin end of the wedge!) 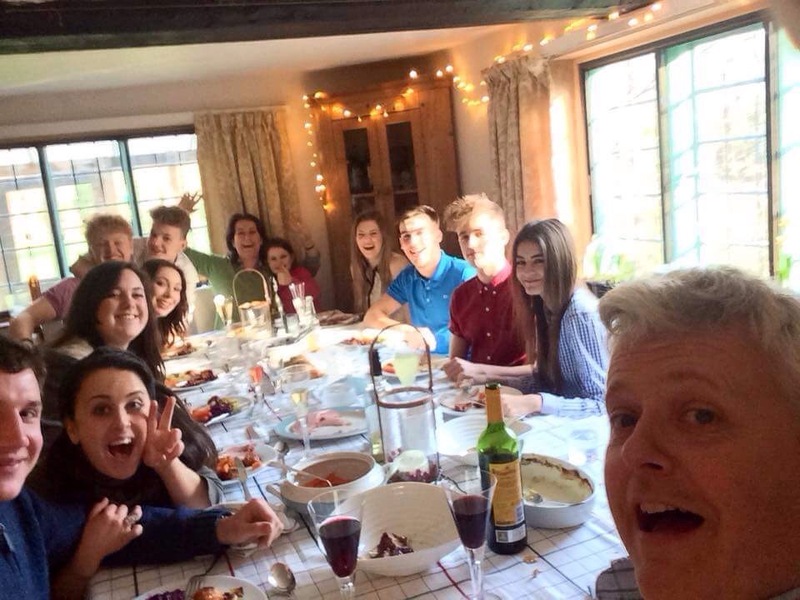 which as you can see from the photo below, was very thin indeed! Not surprising it didn’t withstand the rigours of life below the waterline. The thin end of the wedge? The plank came out fairly easily once I yanked out the caulking. I’m reassured that the cotton looks in good condition so hopefully if I can just rake out and replace the old putty from the obviously cracked areas I wont have to renew it. Pulling out the cotton caulking. Getting to the rivets inside was a pain and I ended up removing the bench seat… It came out relatively painlessly and I’m now considering pulling the other one out too, if only to make repairs and repainting that much quicker. Removing the bench made access so much easier. 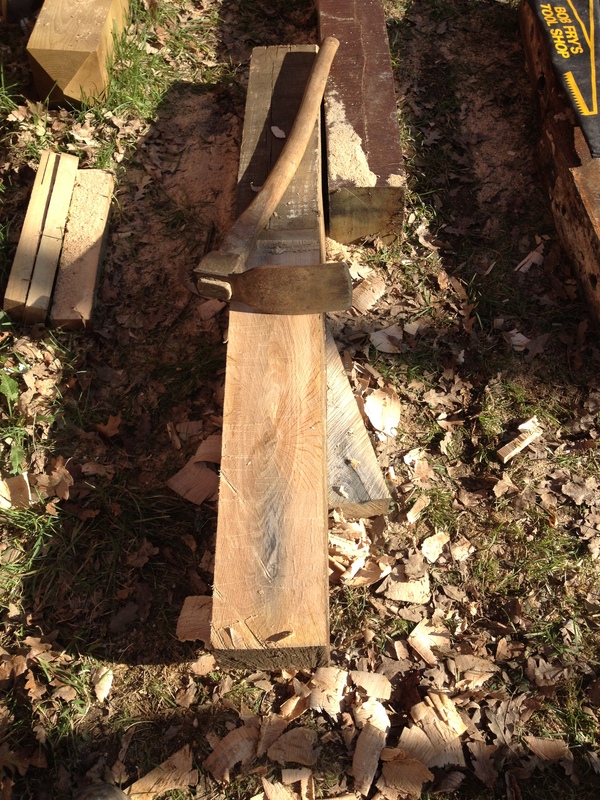 The next task will be finding some Pitch Pine and making a Scarf Joint routing jig. 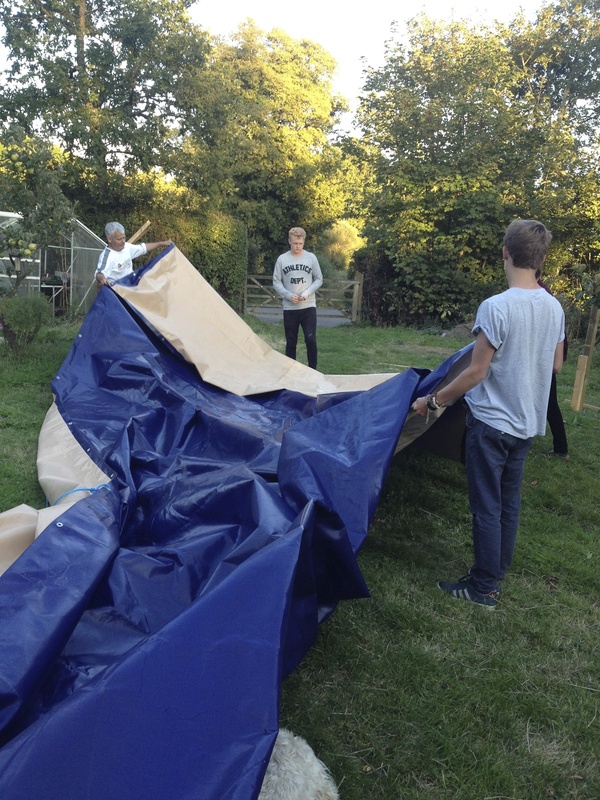 Meanwhile, and for the first time since the Marx Brother’s Tarp install, I managed to persuade one of the boys to lend a hand. 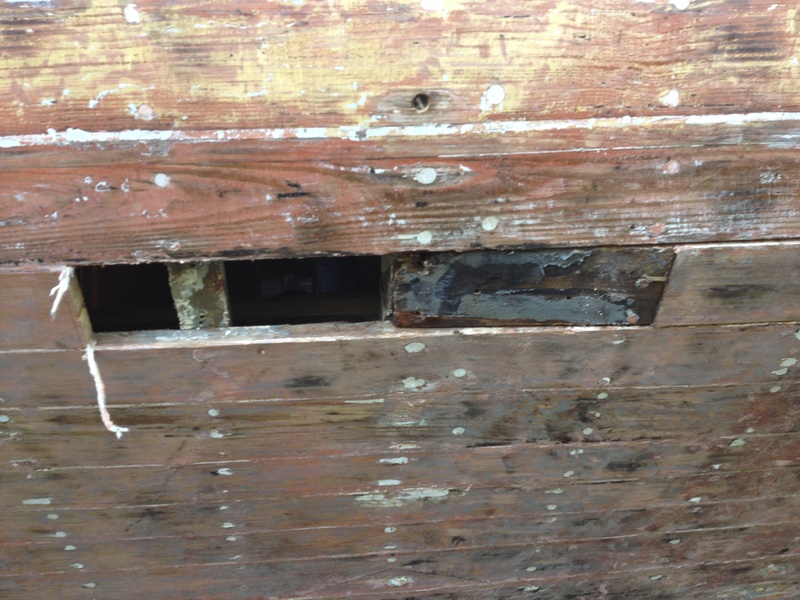 The leperous surface of the sliding hatch was soon looking a lot better after Toby’s hot air and scraper had been to work on it. More sanding needed but definitely starting to look more presentable. 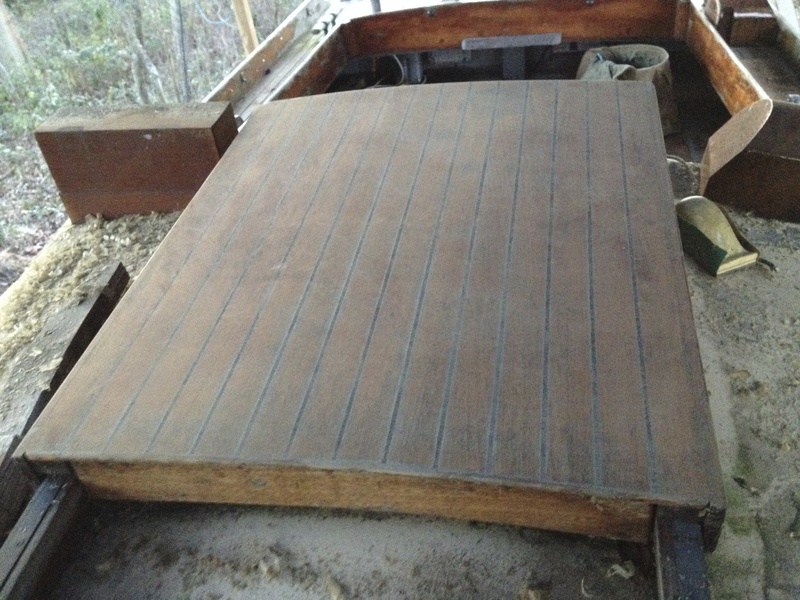 Old varnish removed from the hatch. 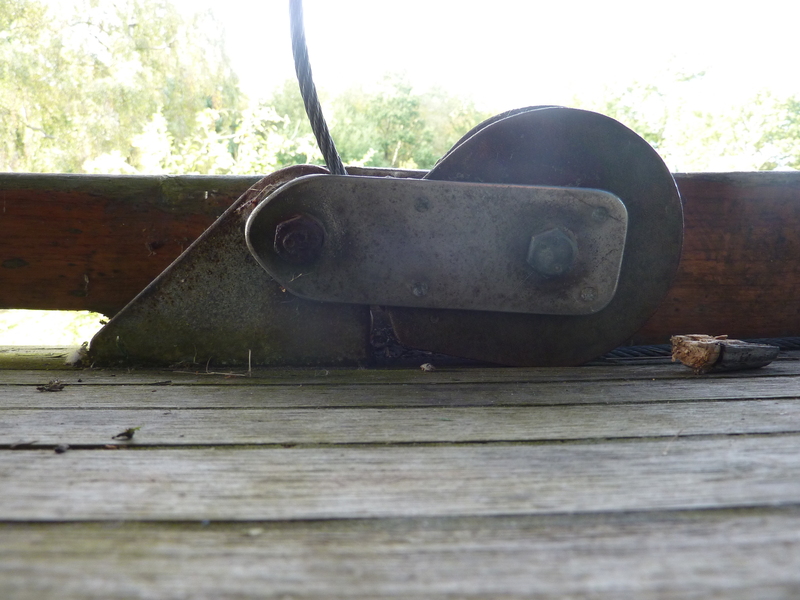 Hopefully off to see a blacksmith in Goudhurst about the gudgeon (there’s that word again) and pintle on Friday. The more I look at it the more inclined I am to think it is a repair rather than replace job. 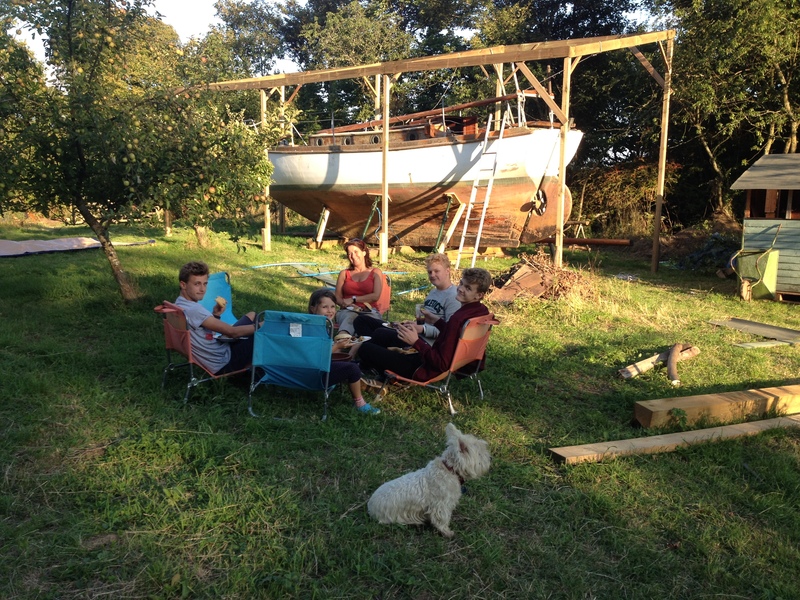 Christmas Eve saw a visitation from Ben, a friend’s son-in-law who just happens to build and restore traditional wooden boats in Bristol, which was nice. 🙂 Lots of good advice imparted but we could have done with about an hour more to really go over everything. 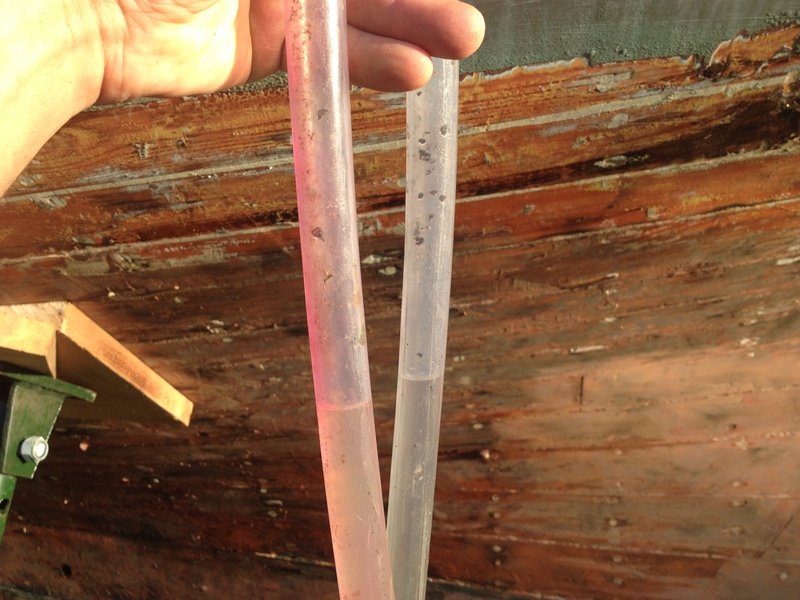 Topping the list of things that need attention was predictably the planking where there are several butts in a row on one frame, the garboard strake which seems to have been partially replaced leaving an odd 2″ strip running the length of the garboard on both sides of the hull. This strip is a bit spongy to my stabbing awl and makes me wonder what it is hiding. Then there is a frame inside that just seems to peter out before actually connecting with anything significant. 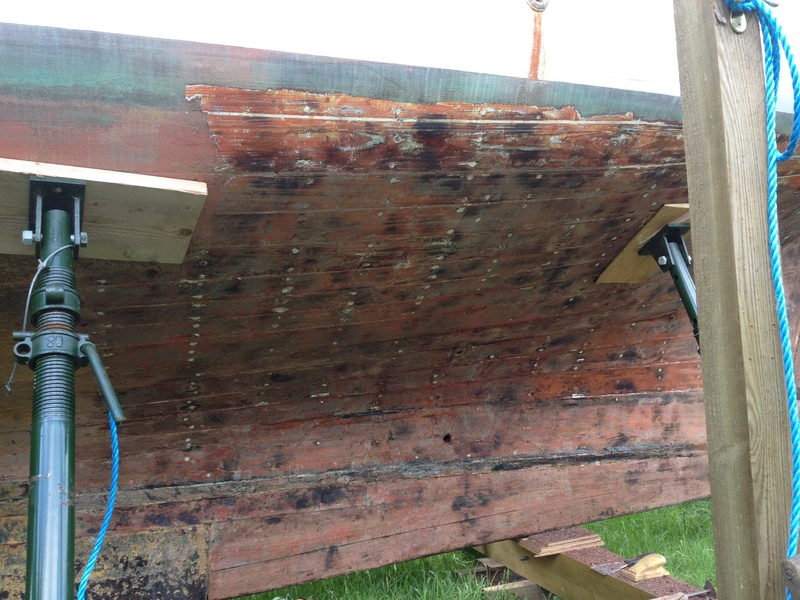 The top of the keel itself has been coated with some sort of bituminous goop that has set hard and blocked any limber holes (if there were any) leading to rusty floors. There was nothing revealed that I didn’t already suspect but it was good to have an experienced eye giving her the once over. The most worrying thing is the possibility that whole hull is hogged! From certain angles there is a definite droop about her sheer between midships and bow. I have been passing this off as her slightly quirky design but thinking about the overhang from the front of the keel, where she is supported, to the bow, Ben may be right. 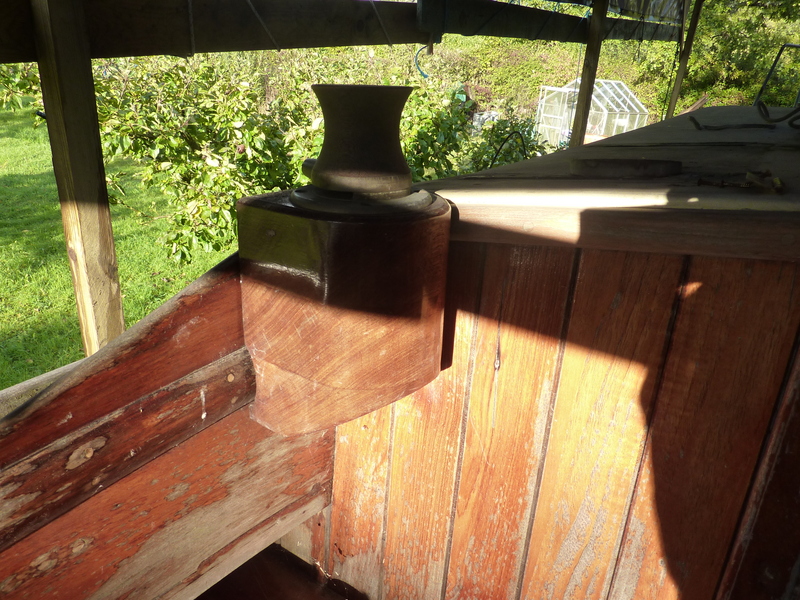 I have temporarily put a post in to shore up the bow and stop any more droop, but if this is an old problem and she has been re-decked and had a new apron fitted in the bow since, I can’t see how it can be reversed. Maybe, like her namesake, her beak is meant to droop. 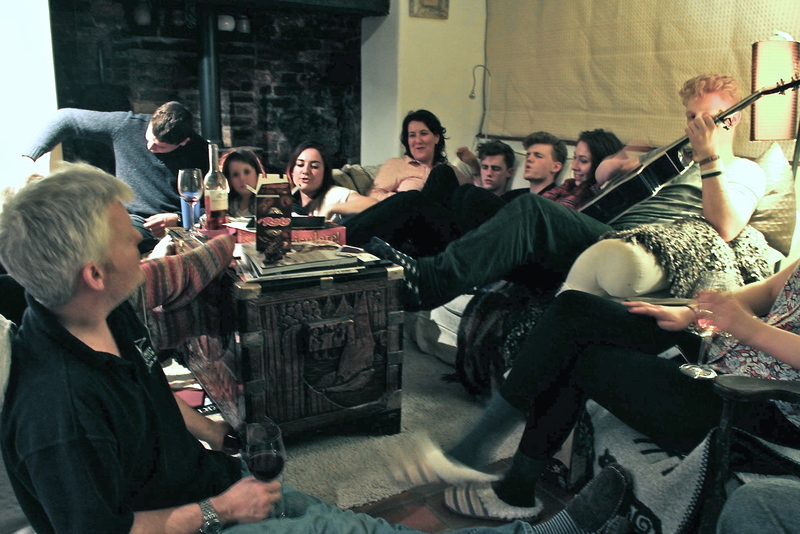 Christmas was spent by ‘the River’ where we gorged ourselves on fine meats, wines, and whiskey and ginger by the campfire…. either the bathroom scales are being mean to me again, or there is obviously more than one type of hogging! 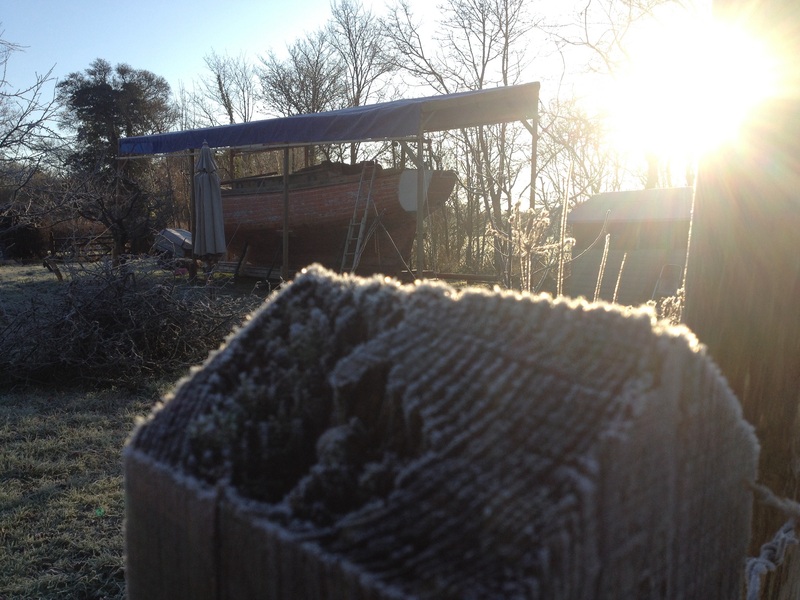 We’re having a bit of a cold snap here and the walk up to the “boat yard” is so lovely I had to post some pictures. Our chickens have long since spurned my beautifully made coop and spent the last few months roosting in the wild plum by the house. It’s a wonder the fox hasn’t got them, but short of chasing them around the garden every night there’s not much we can do. 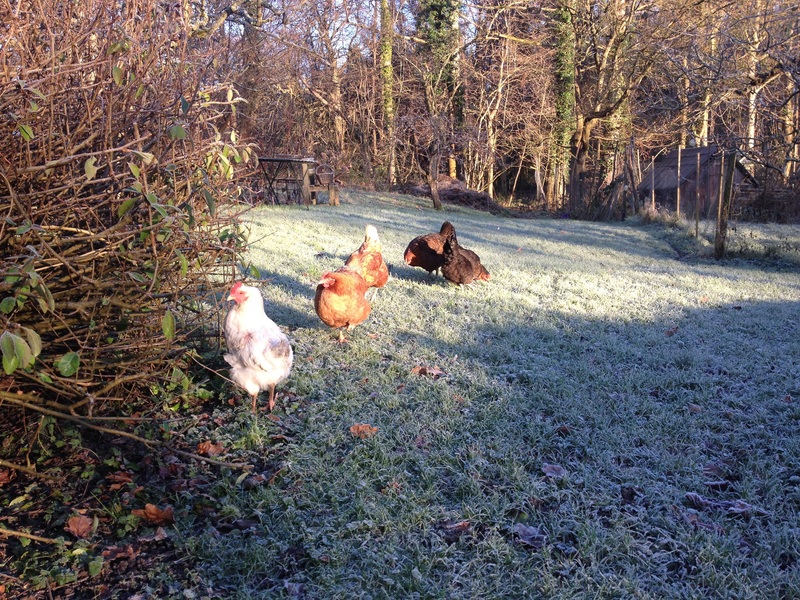 We really thought they would return to the coop once winter set in but they are sticking it out, even though poor Mrs White is moulting and has lost most of the feathers off her bottom and wings! 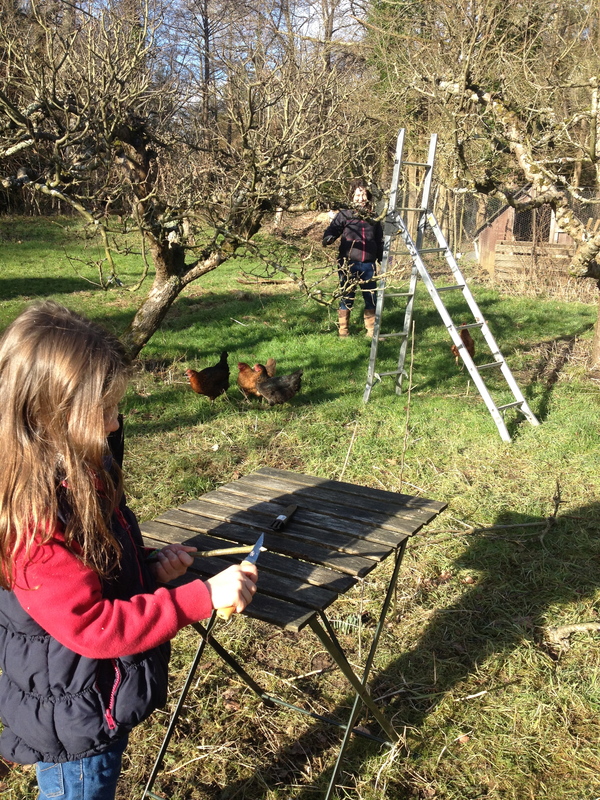 However, work goes on despite the nithering temperature. 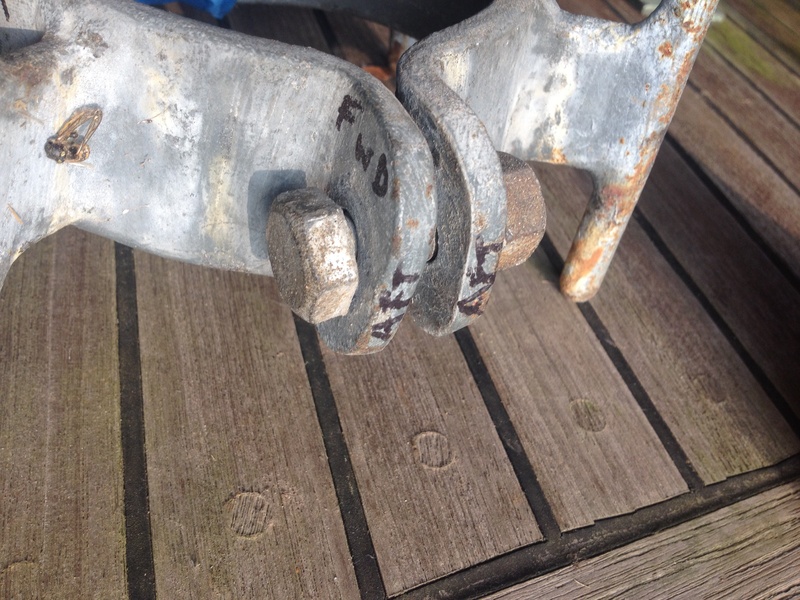 The rudder pintle and gudgeon have been worrying me, the pintle is heavily pitted and the bolt holes are too close to the edges. 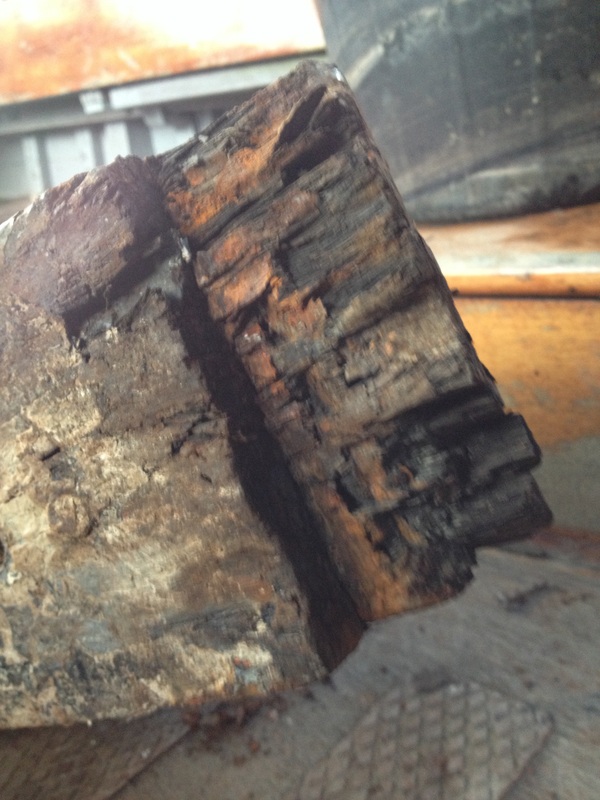 The gudgeon hole has worn very large, leading to a lot of slop in the tiller. I decided it had to come off. 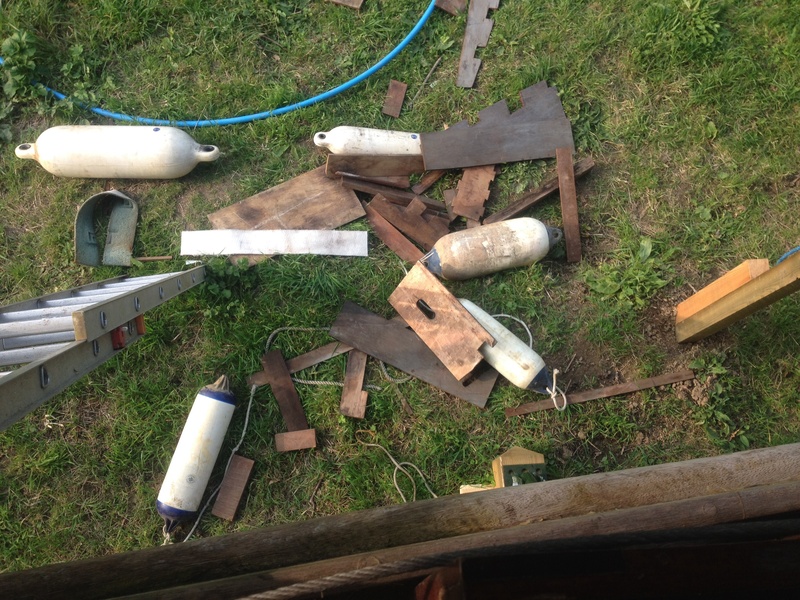 Quite a task on my own but with lots of hammering and oily persuasion first the rudder pin, then rudder, pintle, and gudgeon are removed. The Gudgeon (can you tell how much I love the word gudgeon? 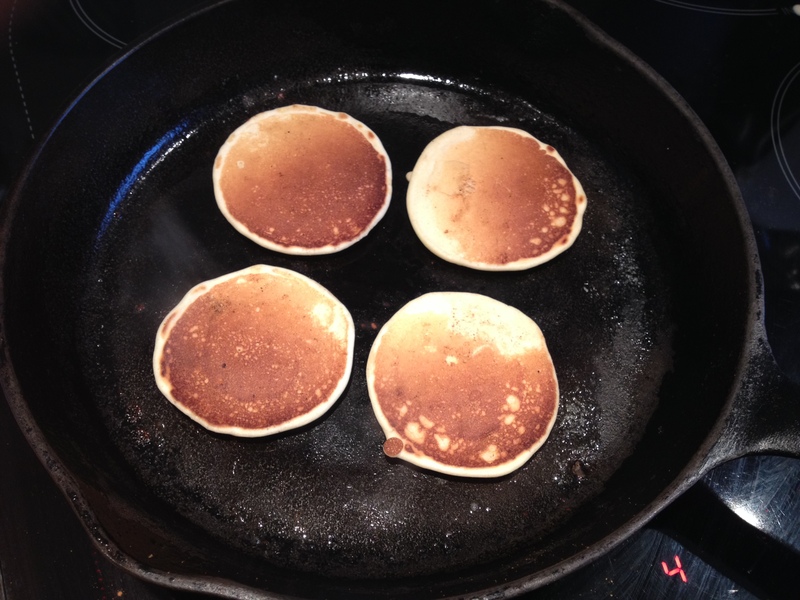 Gudgeon, Gudgeon, Gudgeon…. Crikey! I hope it is the right word! 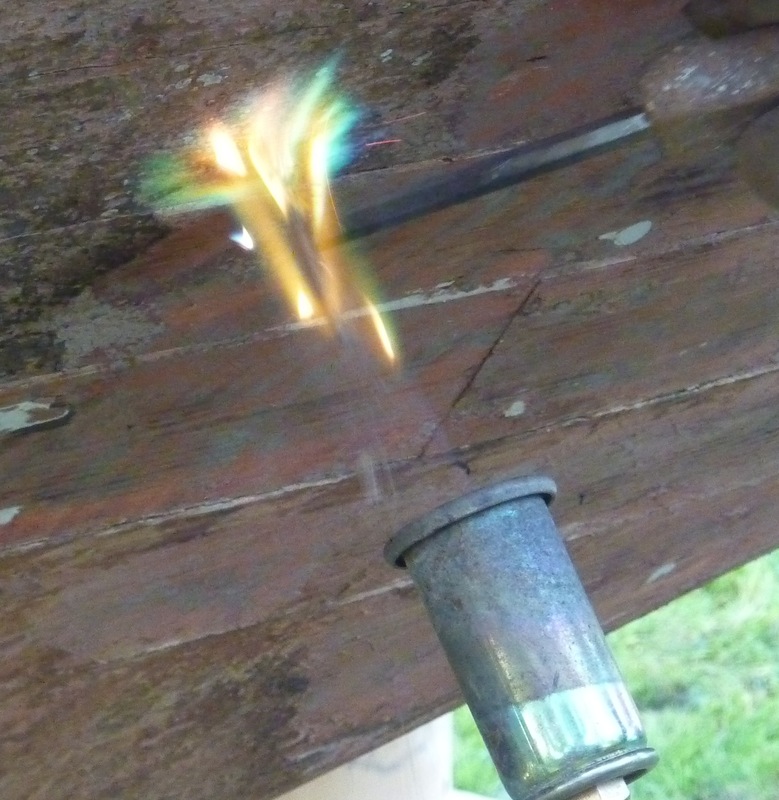 You know how picky these boating types can be) had been bonded to the rudder with some ghastly sticky putty and took some persistence but finally came off. 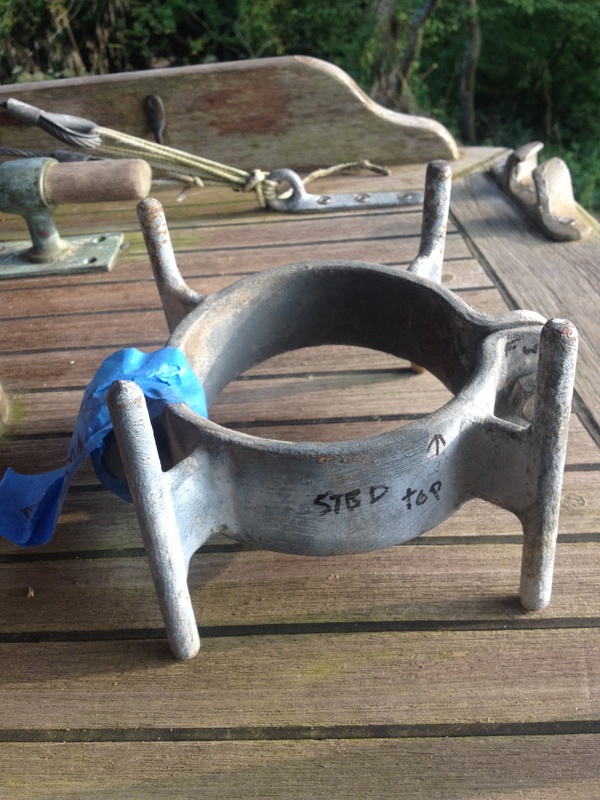 Now to find a friendly blacksmith to repair or remake, and off to some friendly forums to find out about marine iron, cast or wrought, bronze sleeves or not, galvanised or painted…. or both? So much knowledge I have yet to acquire. 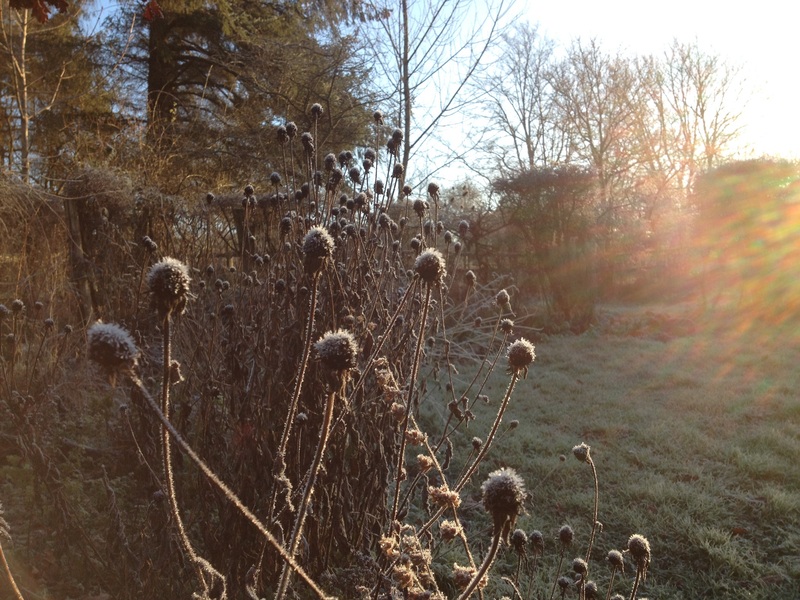 That’s it for now, hopefully more time over this Christmas break for some more frosty “work”, and more blogging (much warmer!). I’ve been cogitating on the layout inside and wondering how the forward bunks will work with a bloody great mast in the way. Lots of lunchtime doodles later and it was clear I needed a scale plan and elevation of the existing layout to work from. It was grey and miserable on Sunday so I was happy to be below decks, though I could have done with more light. Choosing the bulkhead between cabin and cockpit as my datum I sketched out the current layout. So the question is; should the heads stay where it is, or move up to under the hatch? 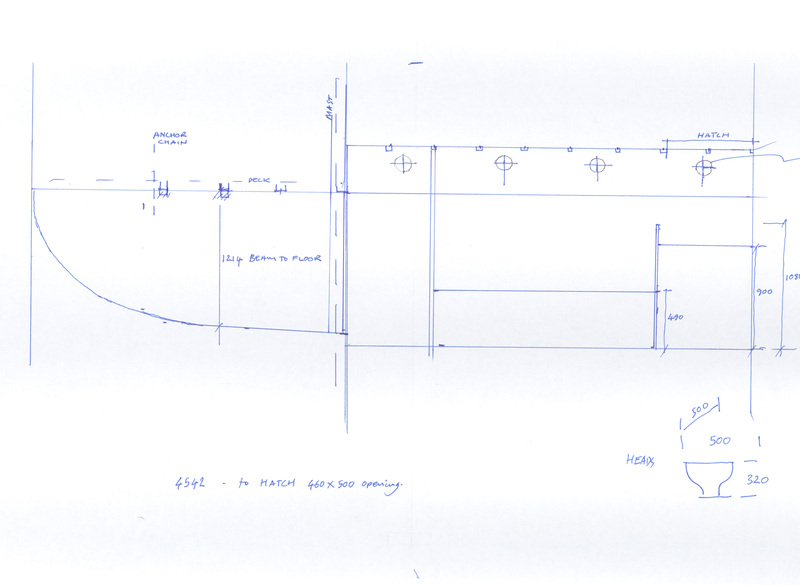 Then the forward bulkhead could be removed and the two forward bunks moved aft where there is more space. 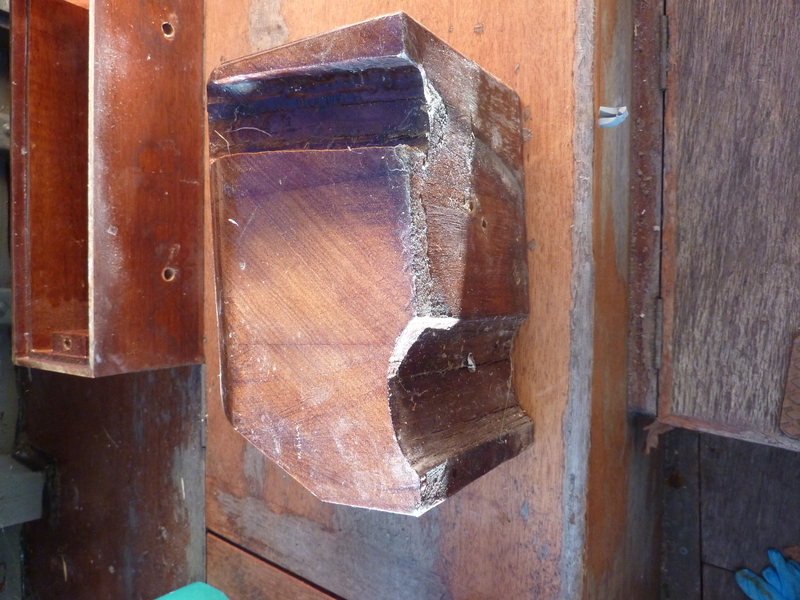 Or is it bad enough squatting in the existing angled cubby hole lurching up and down without restricting the headroom? There is good headroom where it is but the current bunks in the forward cabin are very cramped, in fact I struggle to see how you would access them at all once the mast is stepped. Then again…. crawling in to a bunk maybe inconvenient, but crawling into a toilet could have very messy consequences! 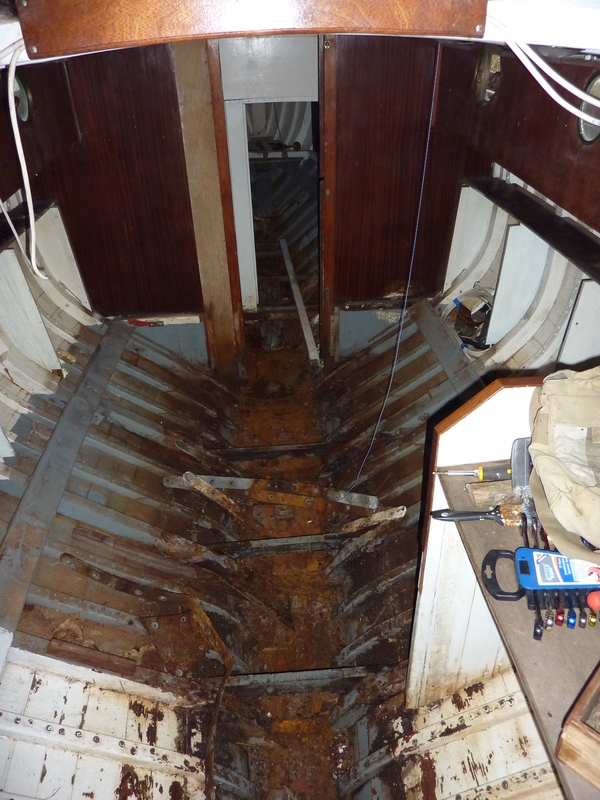 I dont really fancy the ‘bog under the bed’ that lots of small boats have so I suppose really the question is, can I create a space big enough for the heads with a door to separate it from the cabin? 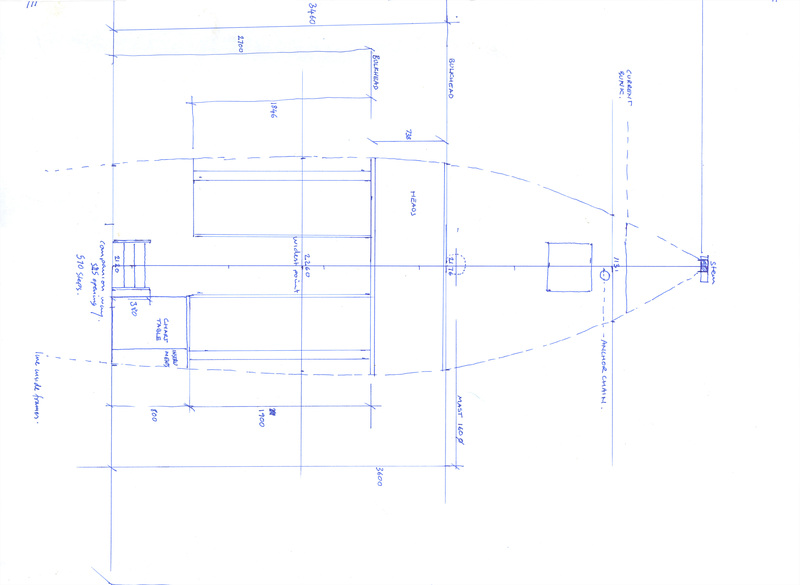 Time to redraw the sketch in AutoCAD and test the theories. Arthritis is a pain in the arse… or to be more precise, a pain in the hands. Two days of paint stripping has left me swollen and sore but strangely satisfied. 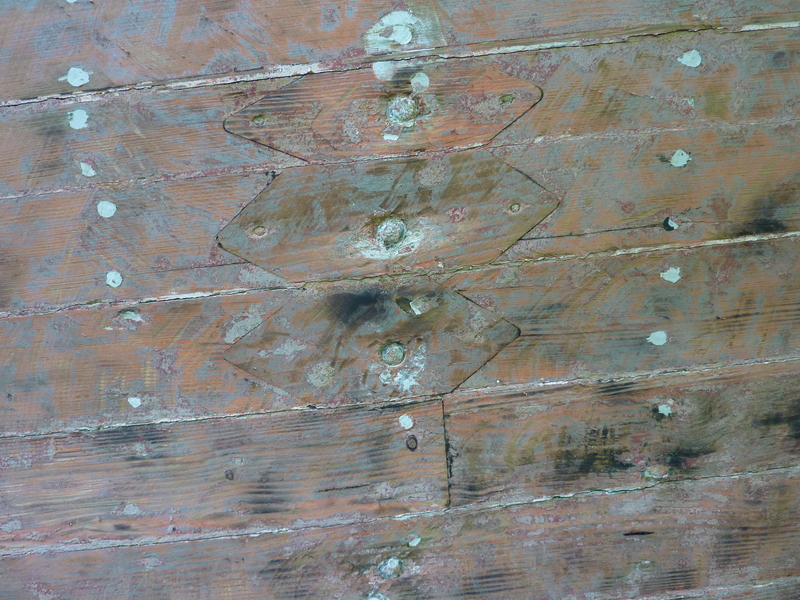 I made the decision to strip the whole hull and not just below the waterline to make sure there were no nasties lurking under the layers of paint, and though it has obviously vastly increased the work it has given me a better appreciation of Flamingo’s lines and reassured me that she really is pretty sound despite her tatty looks. 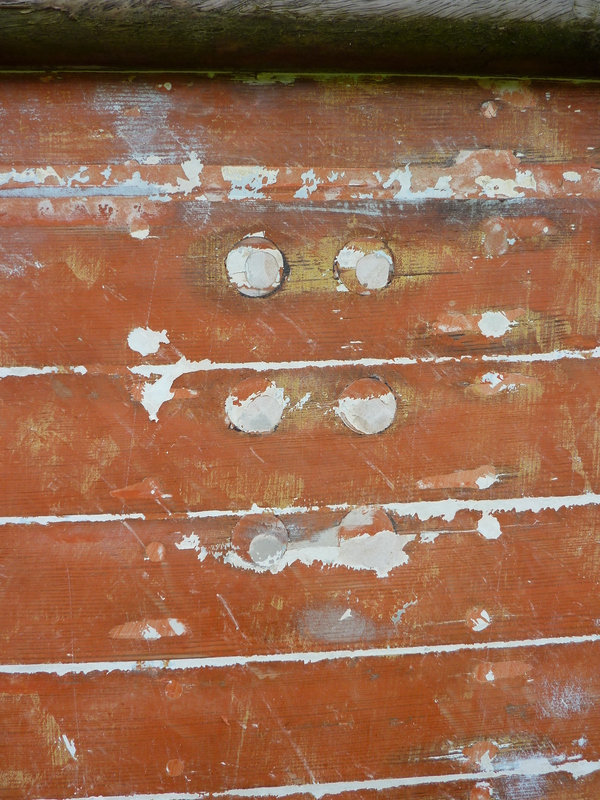 Losing the paint reveals Flamingo’s form and the striping of the planks accentuates her lines. There seems to be a cove line running just below the rubbing strake. It has been filled in for some reason, perhaps to save hassle repainting, or perhaps for aesthetic reasons. The cove line has been filled in. Whatever the reason I think it might be nice to reinstate it. Despite the aching joints, stripping paint in the warm sun has an almost therapeutic quality about it, my mind drifts to future weekends spent, not scraping and aching but sailing and basking… the sparkle of sun on the water the slap slap of water on the hull, perhaps the soft pop of a bottle being opened… bugger! Another burnt bit! 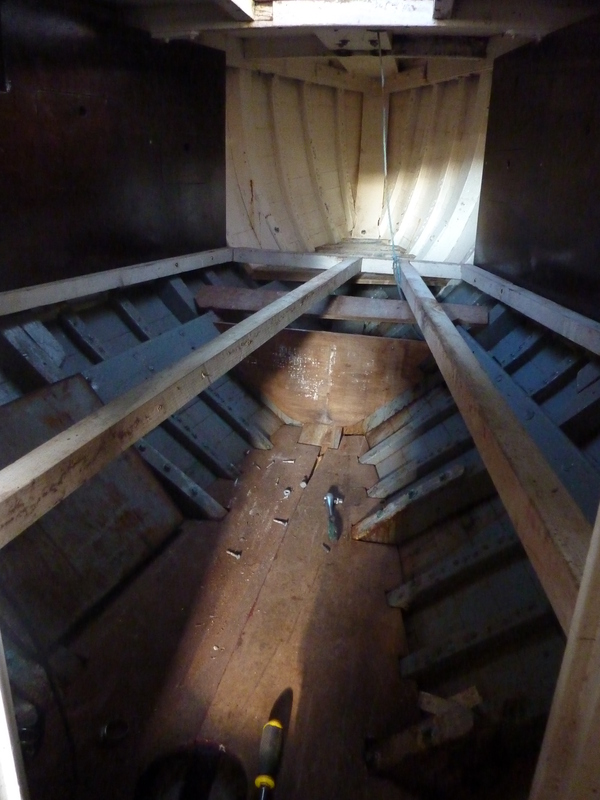 Taking a rest from scraping I get down below to remove the huge clonky sides of the fore cabin bunks. Very safe and reassuring in the rough stuff I’m sure, but almost impossible to get into your bunk. Anyway they are now removed and I can start to work out just how to squeeze a double berth into this tiny space. 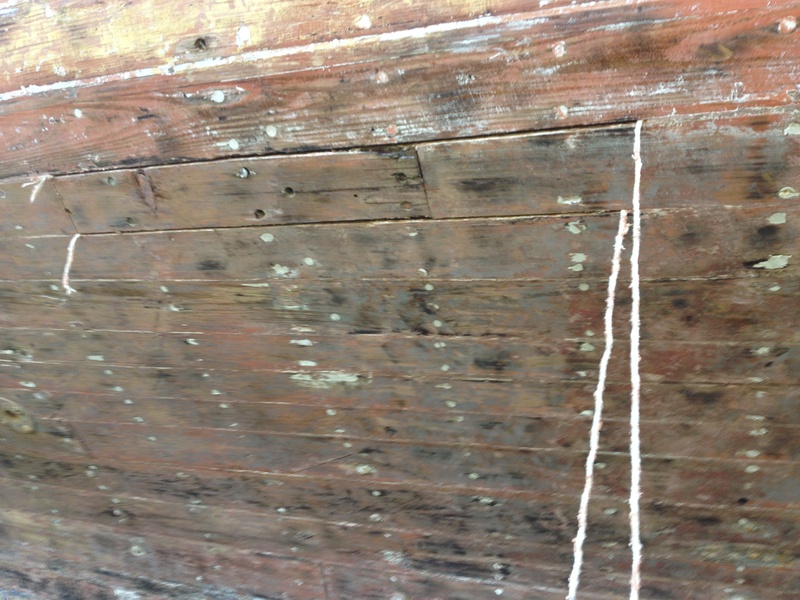 The blue line hanging down shows where the anchor chain falls. I think some sort of tube will be needed to direct it away from our feet! All the scraping and stripping has revealed a lot of repairs. 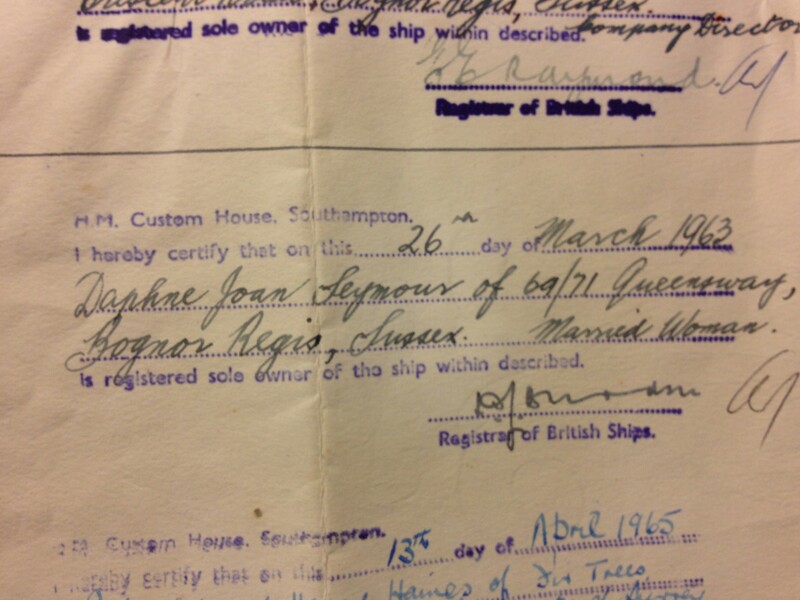 I’m not sure whether these are bodges or proper jobs, a question for the Wooden Boat Forum I think. Slightly worried about how much the timber seems to have been compressed around the bolt heads! 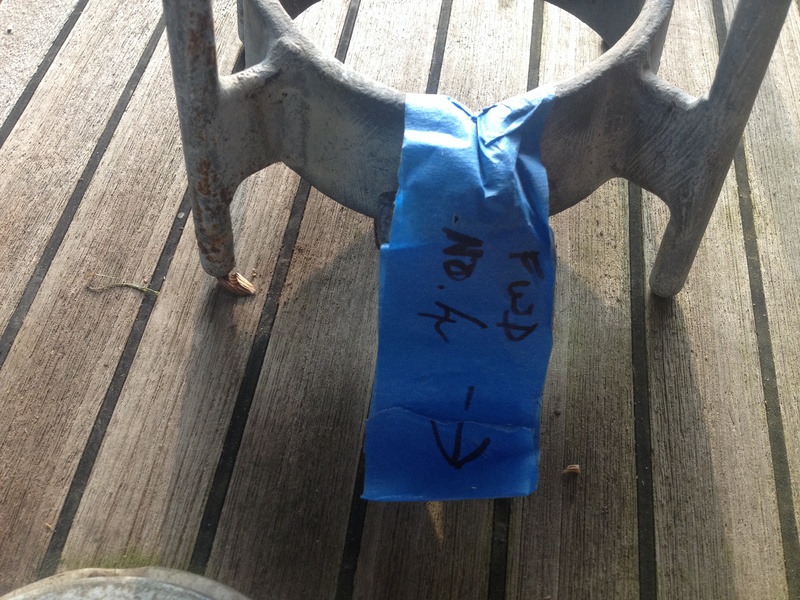 Further inspection of the fore cabin reveals how the stem has been repaired. 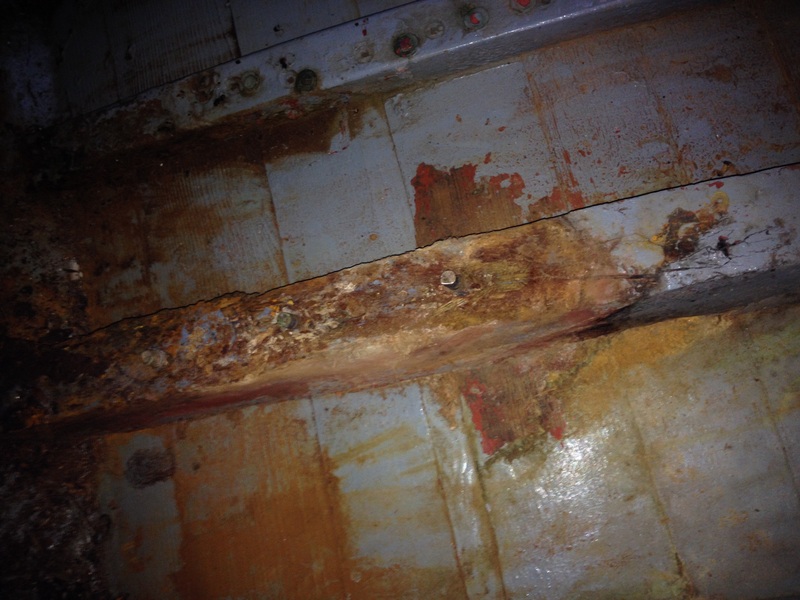 There is a solidified avalanche of epoxy resin that has poured down the inside of the bow! Not exactly in keeping with traditional boat building techniques, but probably very very strong! As I was stripping I wondered what these filled in holes might be for, a quick look inside and all was revealed, bolts for the running back stay pulleys. 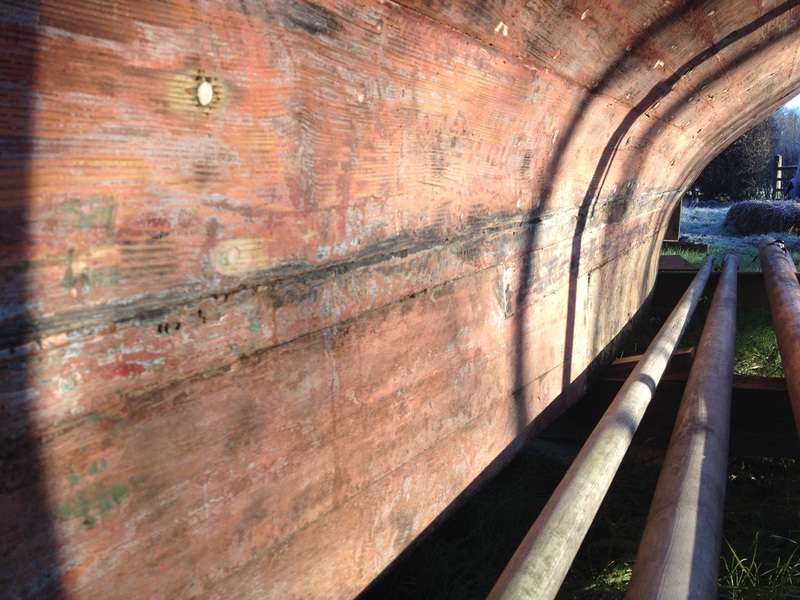 I love how the construction of these old boats is all there to see if you know what to look for. Even though Flamingo is outside I’m still wearing a mask, and given the beautiful colour of the flames coming off the paint there is good reason. Beautiful but probably highly toxic. 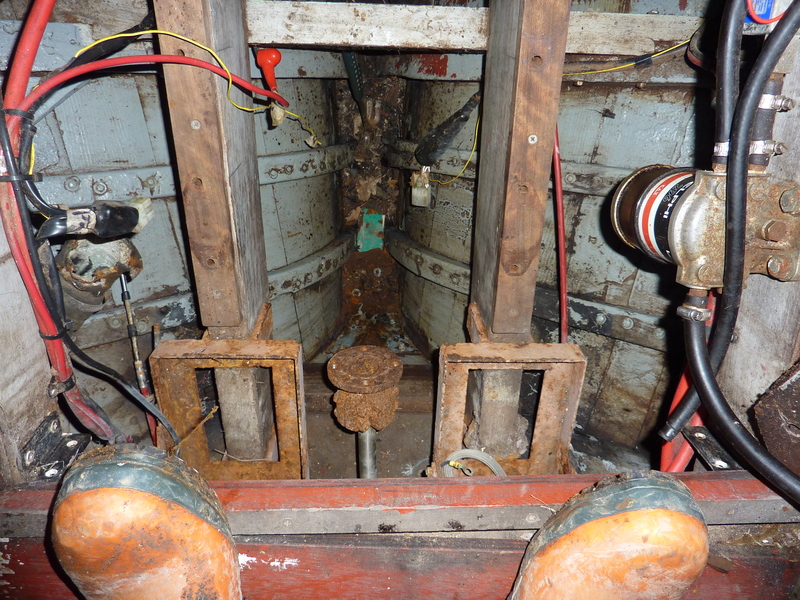 Big fat winch block in situ and living up to its name by ‘blocking’ the side deck. 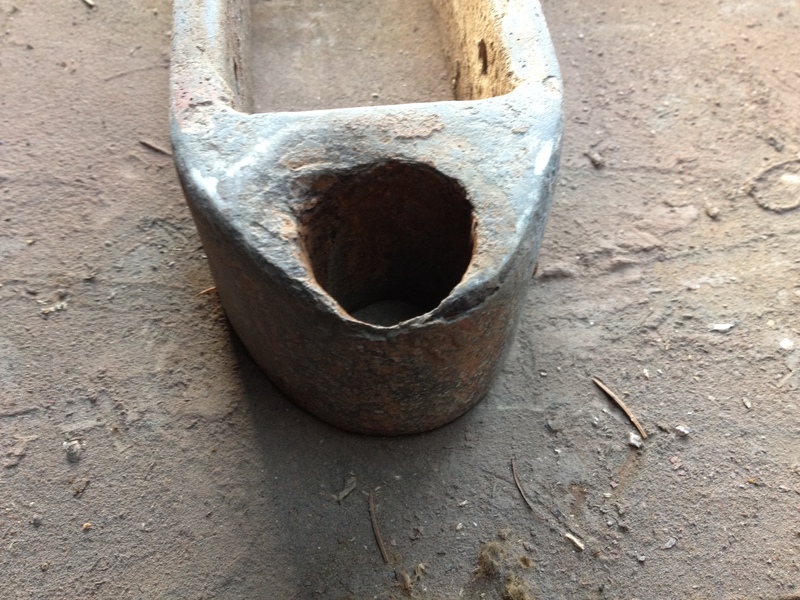 The odd shaped block for the winches removed. OK so it fits, but now that lovely back rest so beloved of my beloved is cramped and uncomfy, not to mention the restriction it will place on the G&T arm movement. 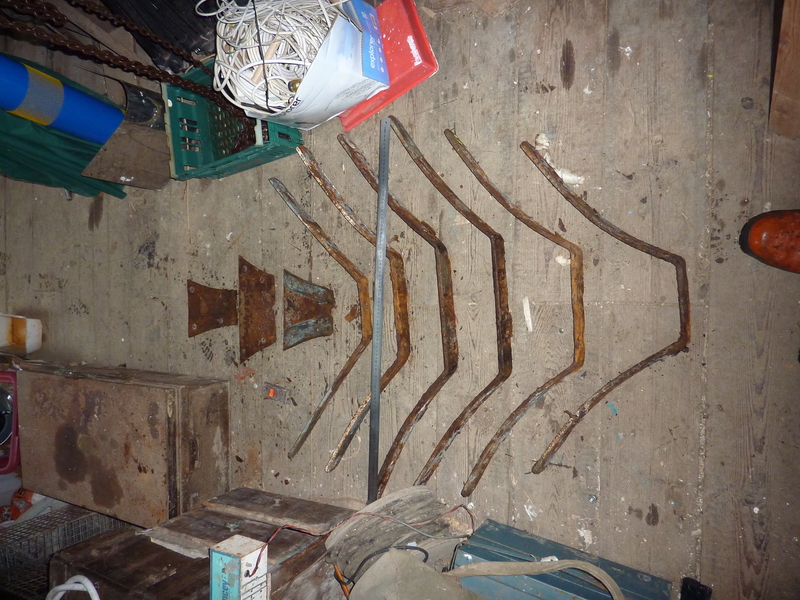 No, they have to go, the winches will go back to their “original” coach roof mounting. 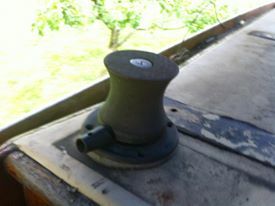 Original Coach roof mount for the winches? A little bit of teak in the sun. She’s going to look so good! A solid weekend’s work to make up for last weekend’s Taxi service and Cactus Hoopla making extravaganza. By the way, the school Hoe Down for which said cactus was made, was a roaring, or should I say knee slapping success. 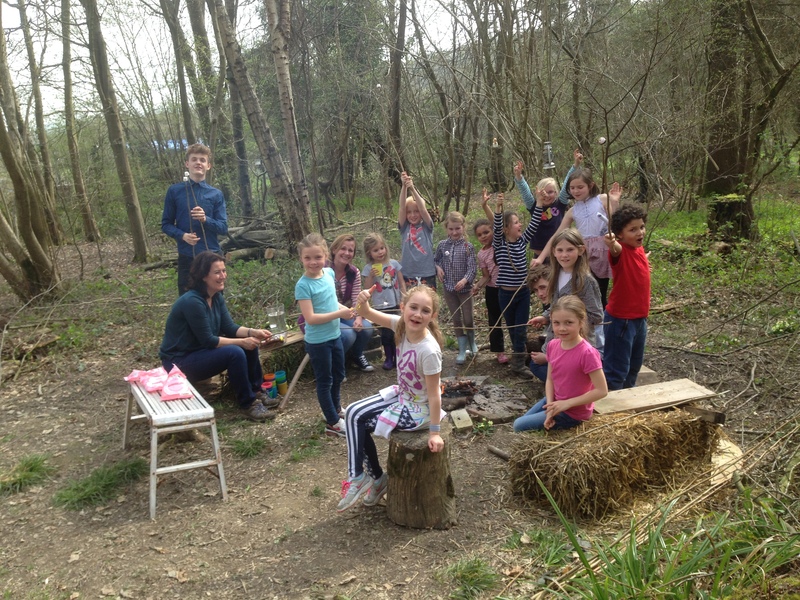 More beans than you can shake a marshmallow loaded stick at, more gold panning and tin can shooting than any child could wish for, delicious soups, line dancing, fire pits, straw bales and a country playlist to die for. Good work The Wells Free School! 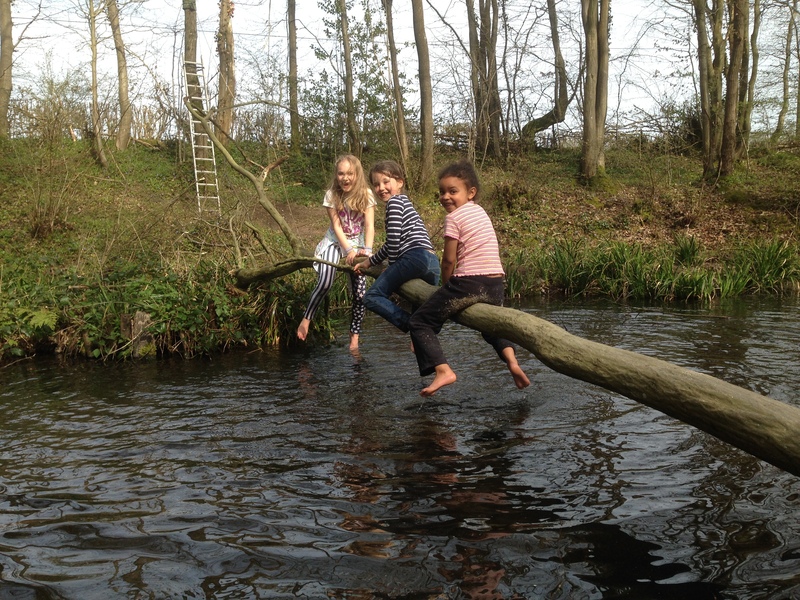 Worth missing a weekend on the boat for….. well almost. I suppose Friday morning’s PFA meeting where I found myself volunteered to build a giant Cactus Hoopla game for the fundraising Hoe Down should have given me a clue as to how the weekend was going to pan out. Friday afternoon was gloriously sunny and I carried on stripping paint. Thinking about how to maintain the waterline I broke from the Darth Vader mask and blowtorch combo to make a water level. In amongst the collection of old cracked, leaking and slug blocked hoses in one of the many lean-to sheds, I found 12 metres of relatively flexible garden hose and 2 metres of clear hose. Imagine my delight when the clear fitted snugly over the ordinary and with a metre of it at each end I had a perfect length water level. Enlisting the help of Tilly to hold one end we discovered, in between ‘accidental’ soakings, “oh sorry sweetheart, did I get you?” 😄 that Flamingo is about 120mm low at the stern and listing about 10mm to starboard. A bit more stripping paint helped me mull over the problem. 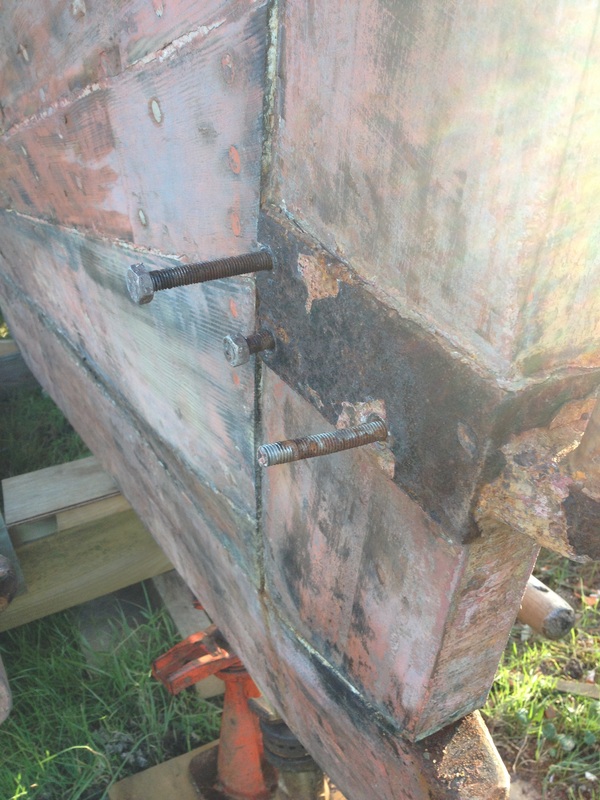 Flamingo is resting on three 150mm x 150mm timbers and it seemed to me that the solution would be to jack the stern up, in order to remove the packing blocks of wood then drop the stern slightly, pivoting the whole boat on its centre support. Once the weight was off the bow I could remove the packing from there and then, pivoting on the centre again, jack the stern up until level. Once level, simply add blocks and wedges to taste… The fact that she is resting on acrow props meant that I could keep her supported throughout. Saturday night, impromptu dinner with friends which obviously led to drinks in the cockpit. The phrase ‘bitten off more than you can chew’ wasn’t uttered at all! Perhaps they were being polite. 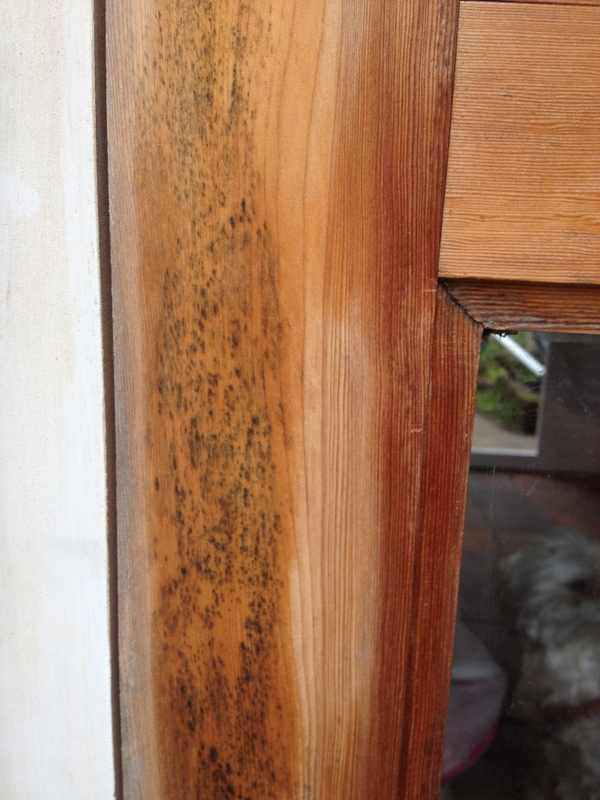 Sunday, painting the front door with a disappointingly poo brown exterior stain gloop. Heartbreaking really to put in all that effort, sanding and scraping, and get such a rubbish result, but we couldn’t see any way to get rid of the black mould stains, so poo brown it is. 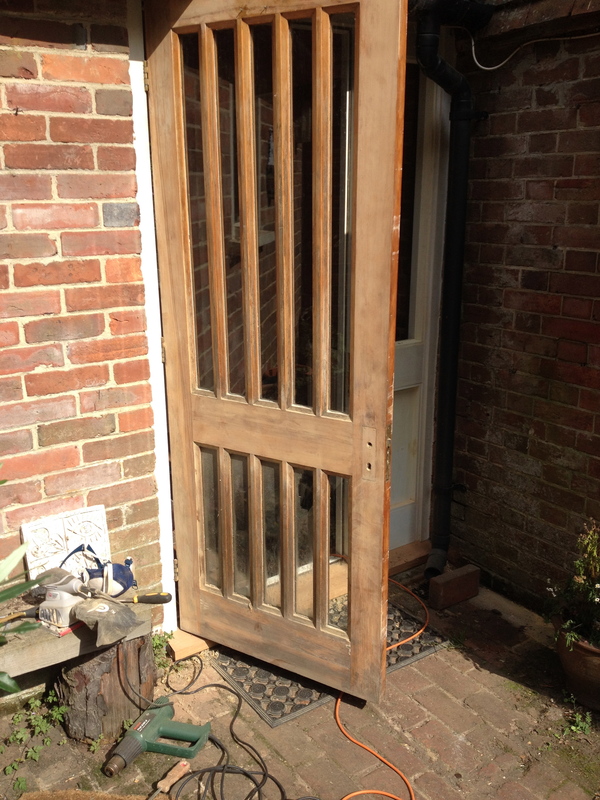 Stripped, sanded, cleaned with white spirit… still mouldy. 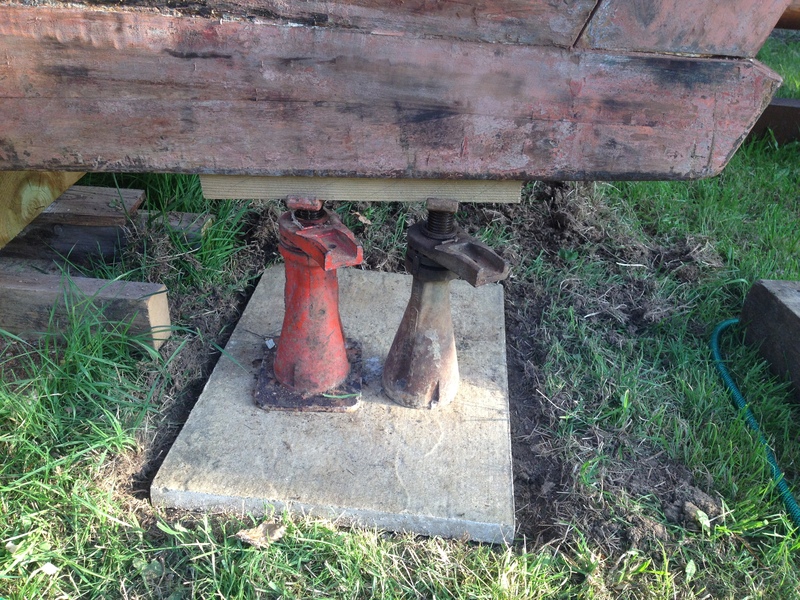 Venerable Lorry Jacks still in gainful employ. The stern is about100 mm lower but there is no sign of the bow lifting. I think far from pivoting on the central support she is just sinking it gently into the ground. 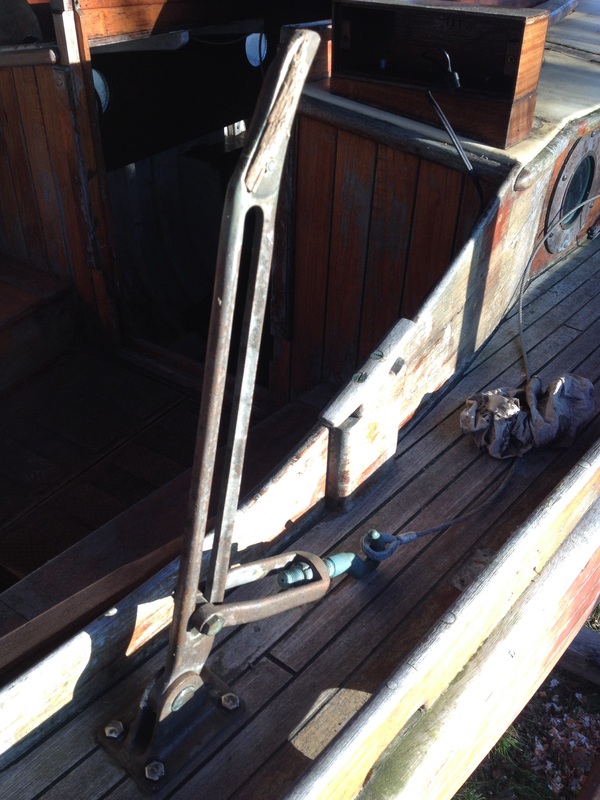 I may have to employ another jack as a persuader at the bow to help…. But that will be a job for next weekend, when the boys are down and just itching to get stuck in helping with Dad’s project… Or, as is more likely, just happy to stand around laughing at the old man as he grovels about in the stinging nettles and plays with bits of hose and old lorry jacks. Back aching, arms aching, and only about 15% of the hull stripped. 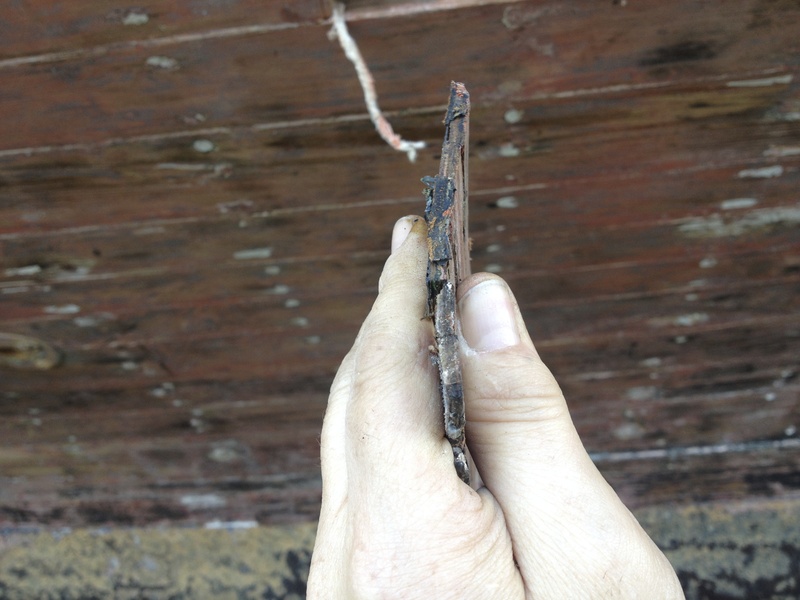 The hull seems to have been painted with a multitude of colours and paint types but the base layer is red and has soaked into the grain of the wood making removal impossible. 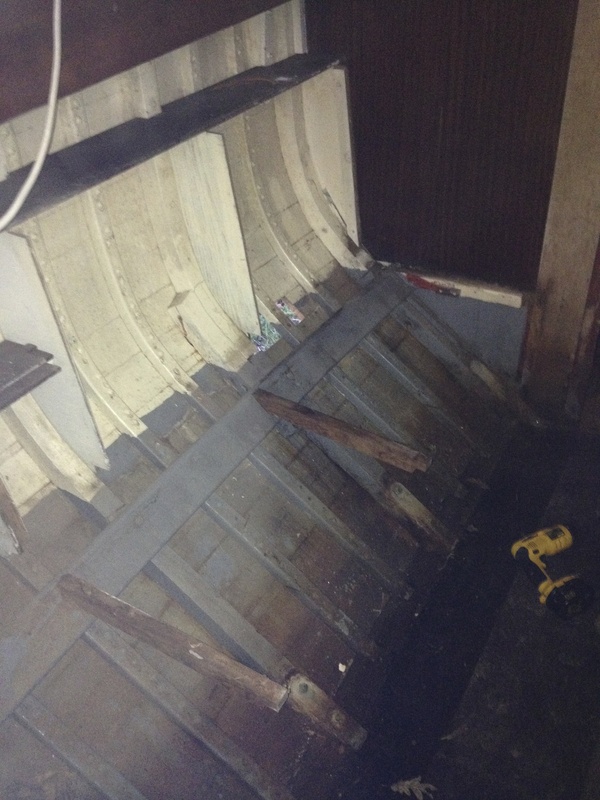 At least I can see any damage and assess which planks need replacing or patching. Laurent Giles levers and misleading labels. Not content with shortening my weekend with work, fate had another treat in store in the shape of a visit to Southampton University with Toby. Though it was a treat to look around such well equipped workshops and studios, and to talk to the staff and students who were equally enthusiastic about the course (Mechanical Engineering) it was still another day out of the weekend, another day not working on the project. 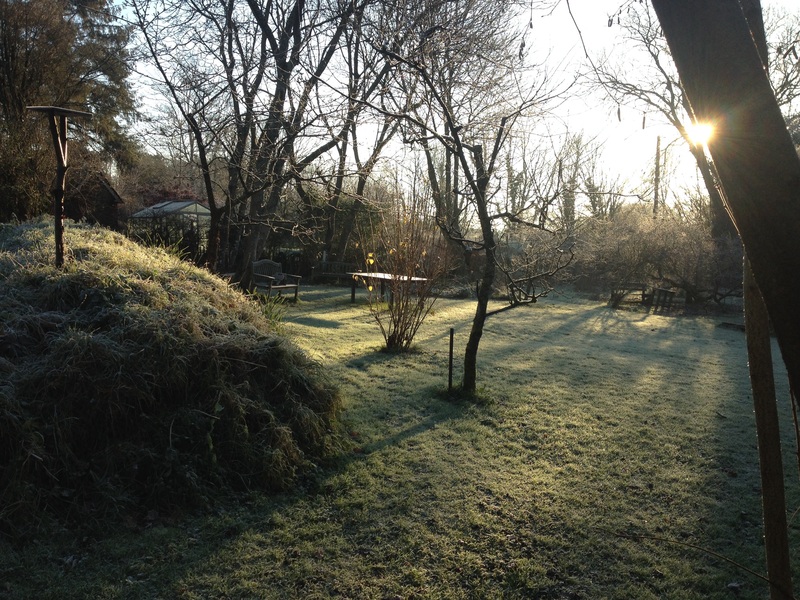 However, Sunday dawned bright and dry and I set about finishing off the shelter. A makeshift handy billy, a kicking strap from a dinghy in a former life, helped tension the triangulating wire as I seem to have lost the fencing pliers and after a lot of wobbly ladder climbing, bruised knuckles and traipsing back and forth to the workshop, why is it that the battery always runs out when you are at the top of the ladder on one leg and just about to get a batten screwed in perfectly? Anyway, finally, I think the shelter is about ready. 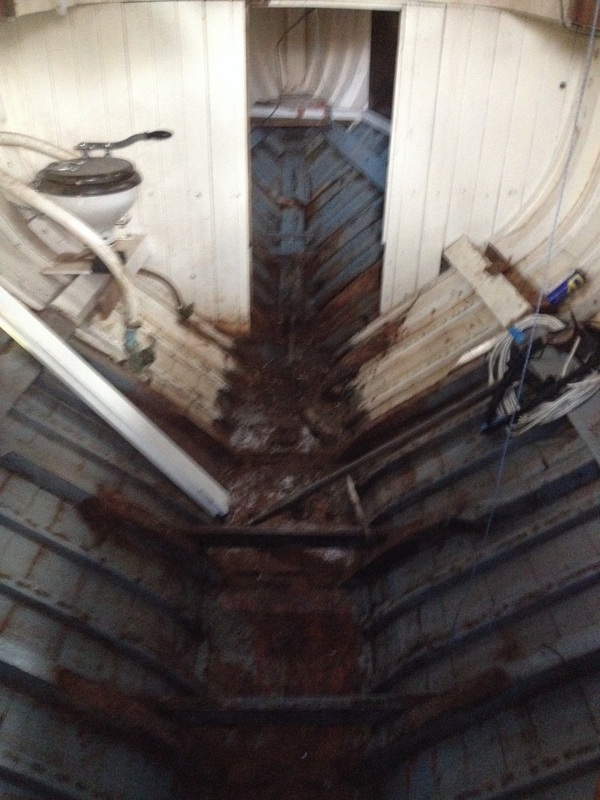 Time to carry on with ridding Flamingo of the accumulated junk that is making it hard to see her potential below decks. 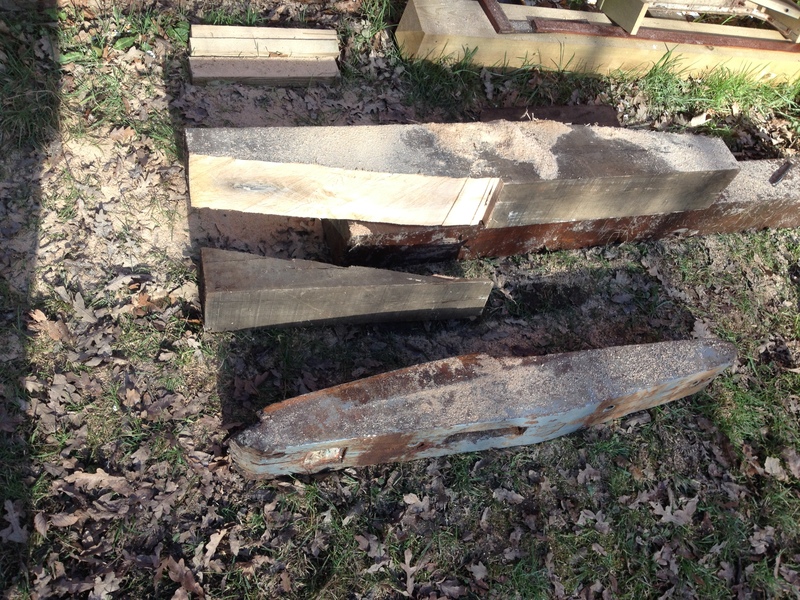 The previous owner didn’t believe in throwing any piece of wood away…. no matter how small. Huh? If that was the front, shouldn’t this be Port? 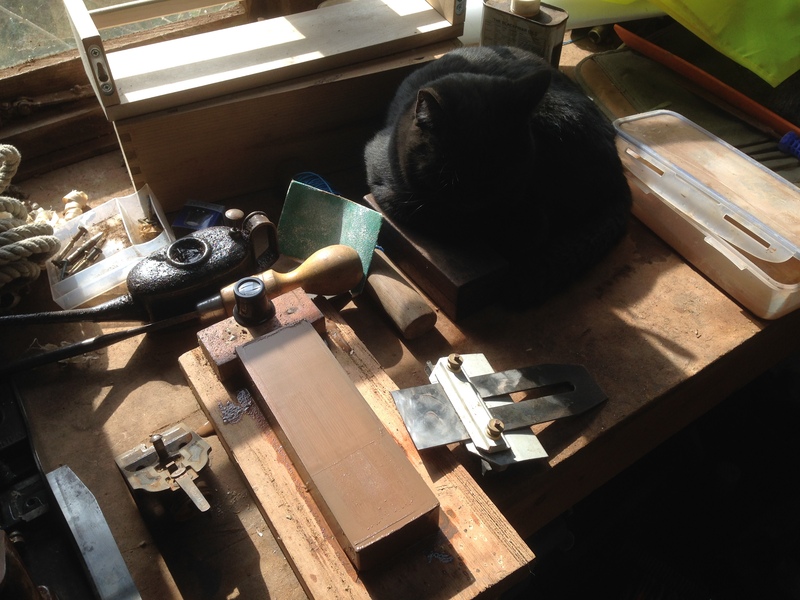 In the process of clearing out all the bits of ply and scraps of hardwood I enlisted Tilly’s help to see if some of the more intricately shaped pieces had a home in the locker as they looked like they’d been cut around the frames to make a floor in there. Having exhausted that activity in about five minutes, Tilly declared, “Daddy, when the boat is finished I think I will like it, I don’t like it now though, so I’m going back down to the house. Exit fickle daughter, stage left, or should that be stage Port? 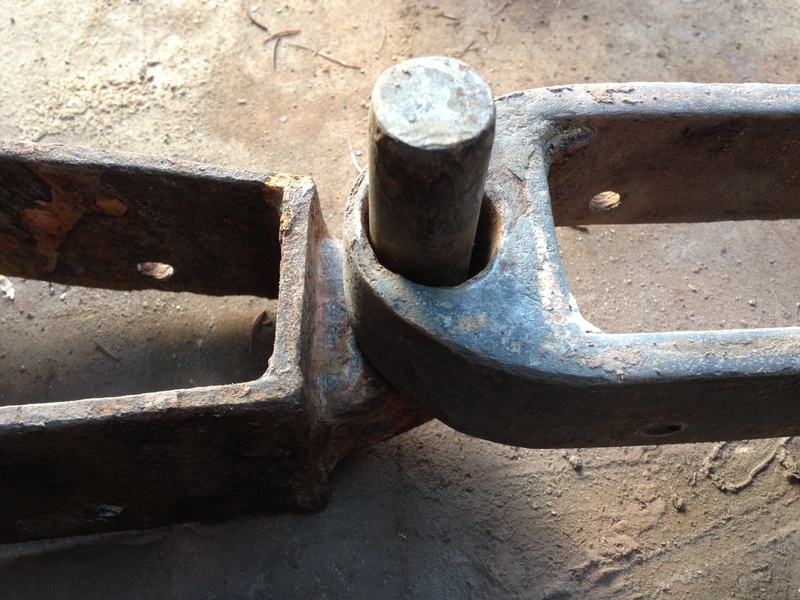 Finally, two nice solid winch handles were unearthed but popping them in immediately highlighted an issue with the position of the winches. Every pump of the handle would scrape your knuckles across the guard rail wire! Thinking about it maybe the solution is just rotate the winches so they pump port and starboard not fore and aft… plenty of time to think about that. Lawn mowing took up a large part of the afternoon as apparently, unfair as it may be, all my other chores still have to be done….. it seems the world doesn’t stop turning just because I’m sitting in the cockpit in the afternoon sun dreaming of muddy estuaries and the smell of the sea…. Wrapping Flamingo up each night and unwrapping before starting work was obviously going to be a pain especially as I invested in a heavy weight tarp. 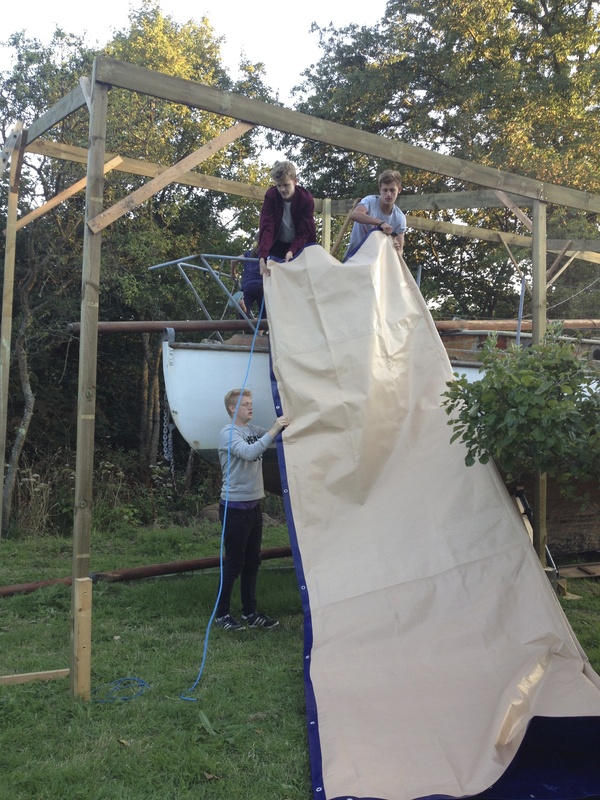 So last weekend’s task was building a frame to support the tarp at a height that allows free movement on deck. This turned out to be rather high! 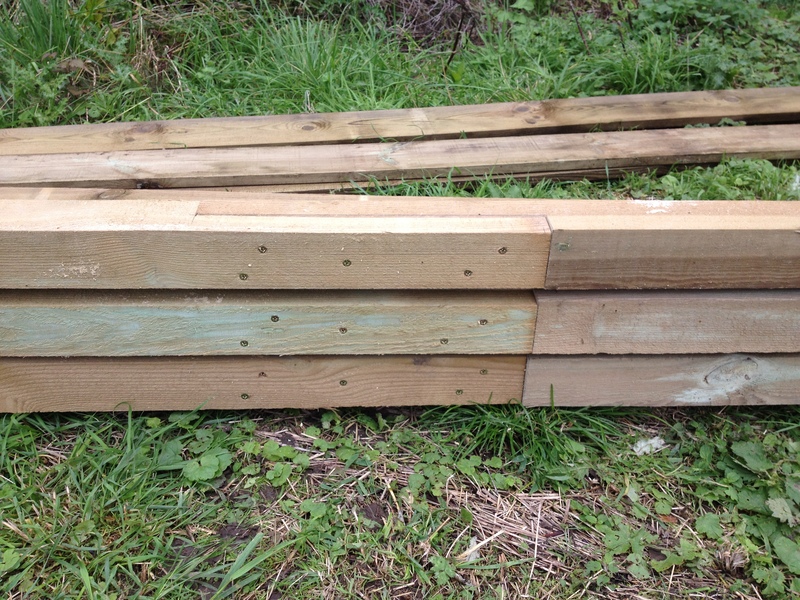 So high in fact that the local timber yard didn’t have long enough lengths of 75×75 in stock. Itching to get on, I bought what they had and spent hours joining lengths together. I’m hand tools only up in the ‘boat yard’ at the moment and ripping down lengths of soggy tanalised timber was hard work. Still, Sunday morning saw four frames all ready to erect. As this was definitely more than a one man job I called in reinforcements in the form of my three sons, Toby, Joe and Luke, or, Harpo, Chico and Groucho as they might more appropriately be called. 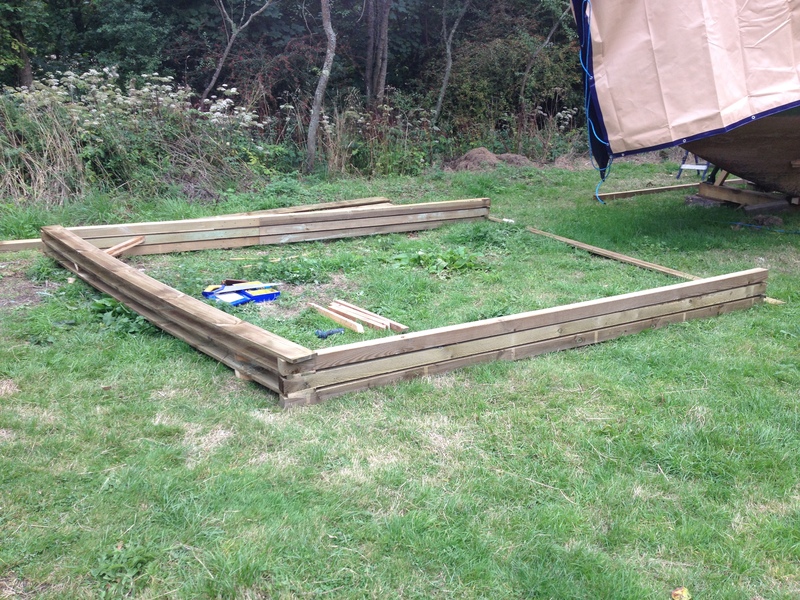 Despite being utterly incapable of concentrating for more than a few minutes without lapsing into some strange code language of FIFA 15 stats, and song lyrics, or leaping onto the deck for a selfie whilst uttering some of Jack Sparrow’s immortal lines, we did manage to get the frame up. All that was missing to qualify the day as a Marx Brothers Tribute, was some swinging plank gags and falling off ladder slapstick. The reward was a well earned BBQ then some tarp wrestling to finally finish off my sedentary, desk job softened muscles. It still needs tweaking to make sure no water pools collect, and a few more braces for strength, but its not looking too bad. Satisfaction, frustration, and the willful entanglement of inanimate things. Today’s task was to get the shed roof on, and weatherproof. I am pleased to announce, after a bit of a struggle, the task is complete. I could, I suppose leave this post there. all the key information has been imparted. Shed up. Roof on. Job done. However what good is this blog if I can’t vent a bit of frustration every now and then? 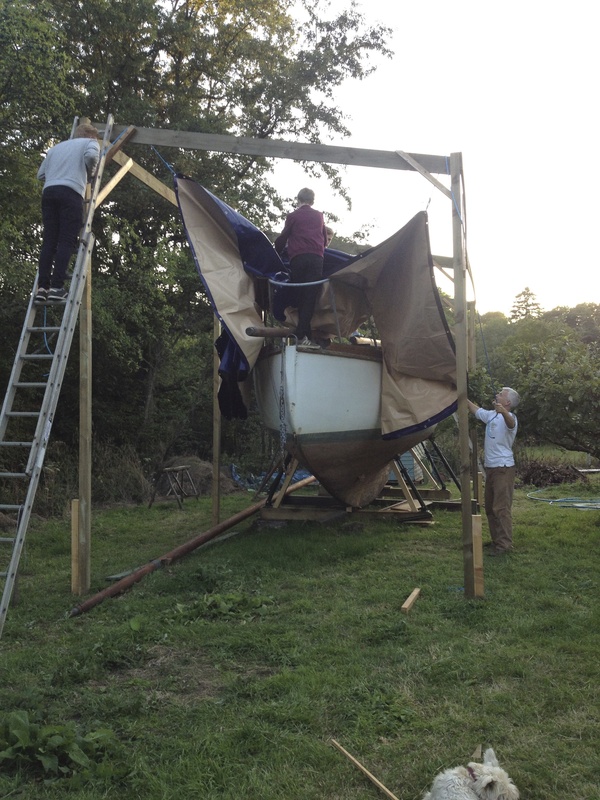 So first I had to take off the tarp that was covering the shed, Tilly and I spent a rainy miserable bank holiday Monday (quel surprise) putting the shed up but ran out of day before the roof went on and had to wrap it in tarp secured with bungee. This is where the willful entanglement comes in. Unhooking the bungee it pinged back and slapped me in the face. As I started to pull the tarp, the wind got up and it slapped me in the face, somewhat annoyed now I yanked on it, it tore. 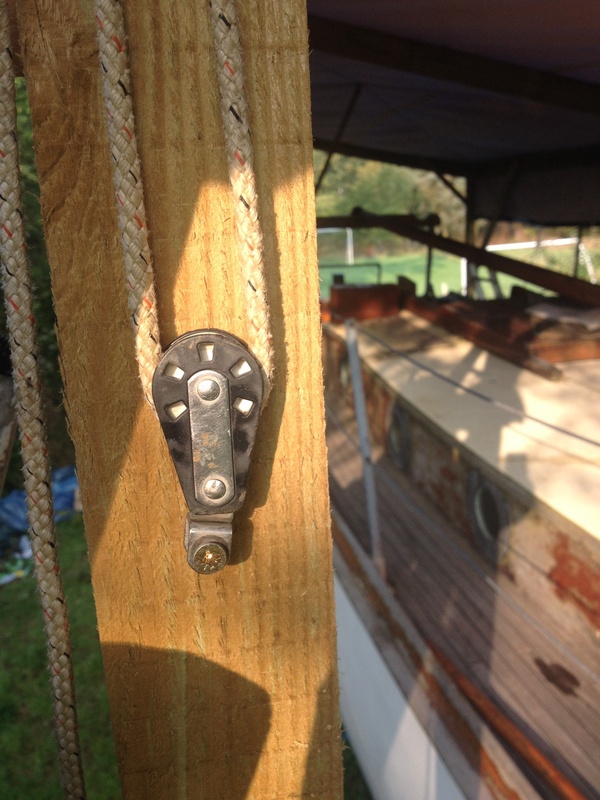 More annoyed I started to pull the bungee cord through the eyelets…. 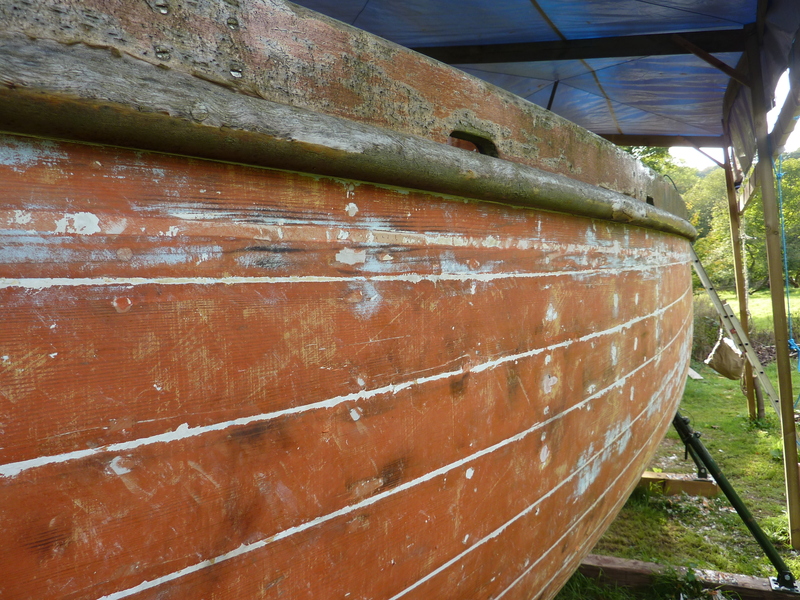 more face slapping, and standing there with the tarp thrashing in the wind, my legs plaited with elastic and my face stinging, I thought, this isn’t boat restoration as I imagined it. No whiff of tar and varnish, no soft swish of a sharp plane blade slicing through wood, no sweet thunk of mallet on chisel. 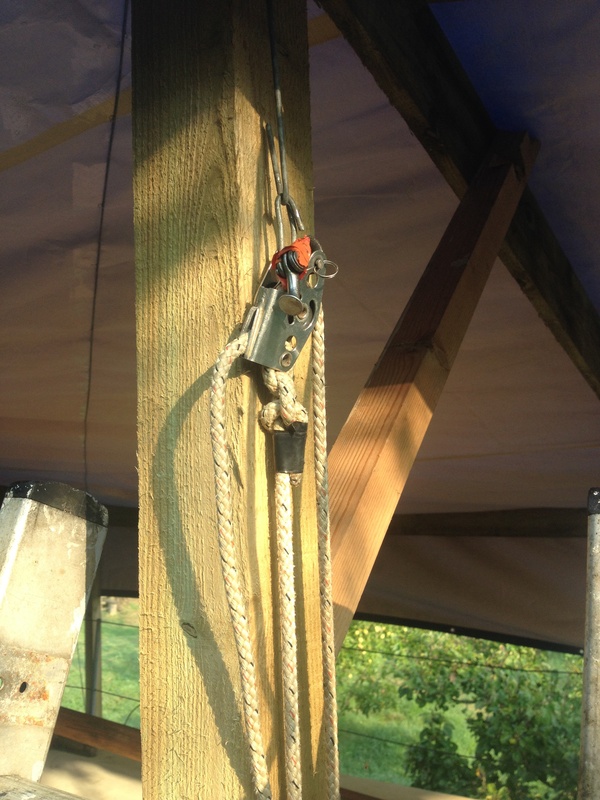 Despite the frustrations, it was very satisfying loading boxes of rigging and coils of rope into the shed. I also popped over to Queenborough to pick up the acrow props that Jim very kindly offered to cut down to size for me, and stopped off on the way back to order the timber I need for building a shelter over Flamingo. I feel the momentum of the project is good and though winter is perhaps not the best time to be outside boat building I am hopeful that the decrease in gardening duties will mean I can sustain it.